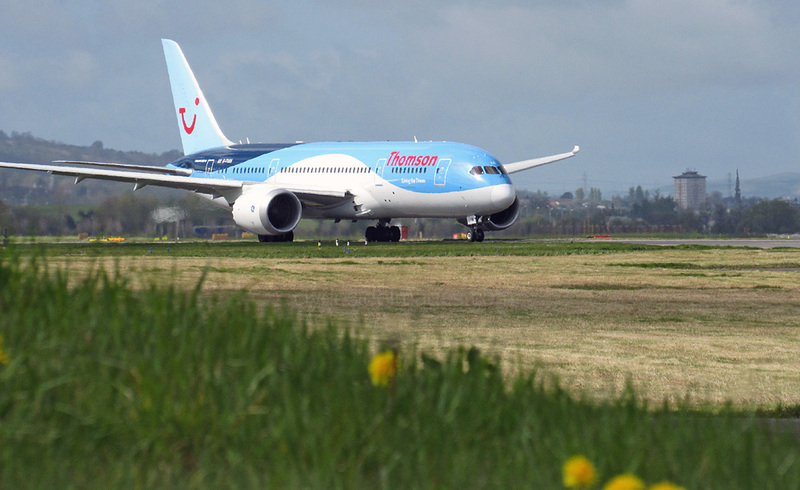 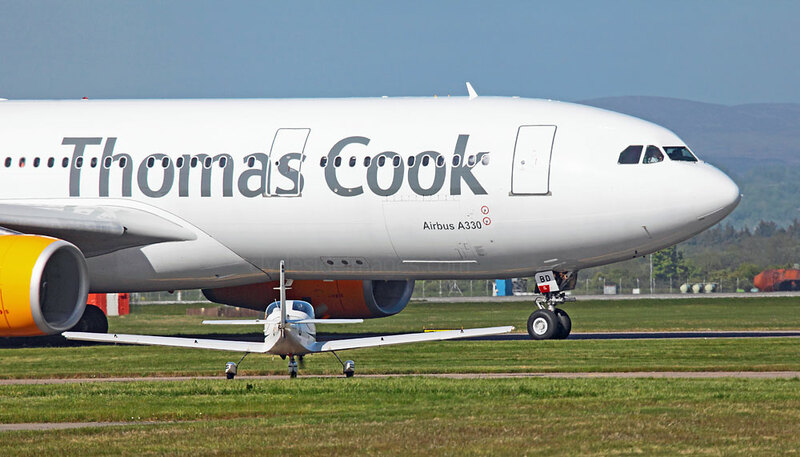 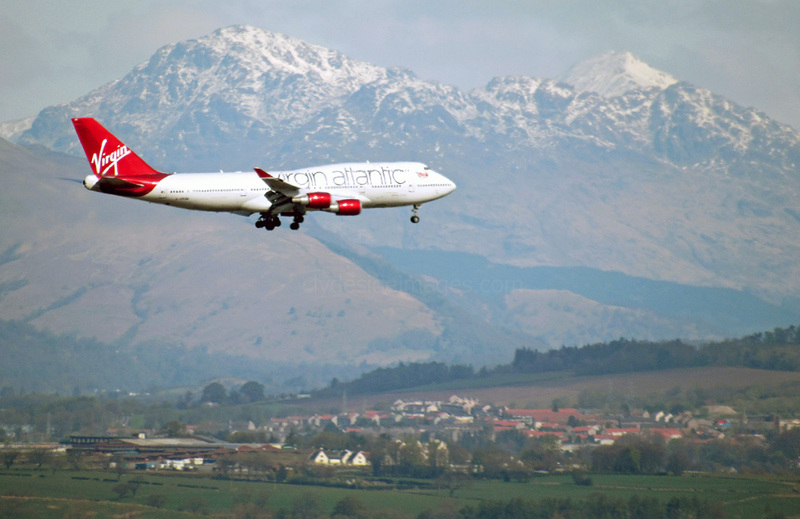 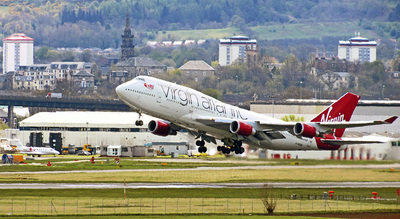 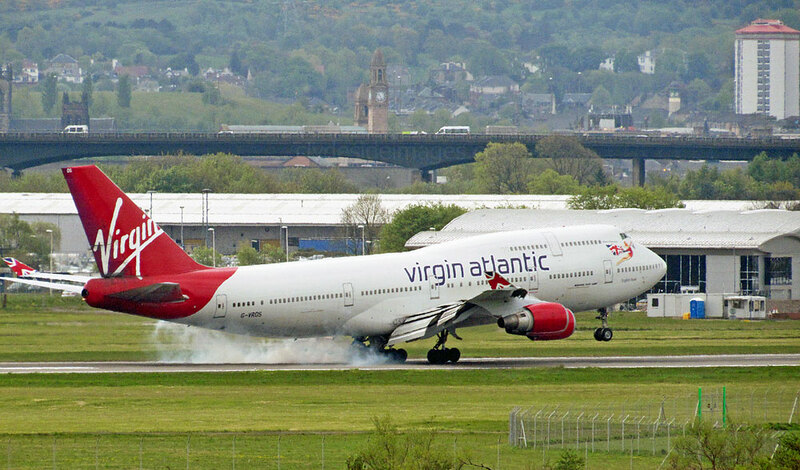 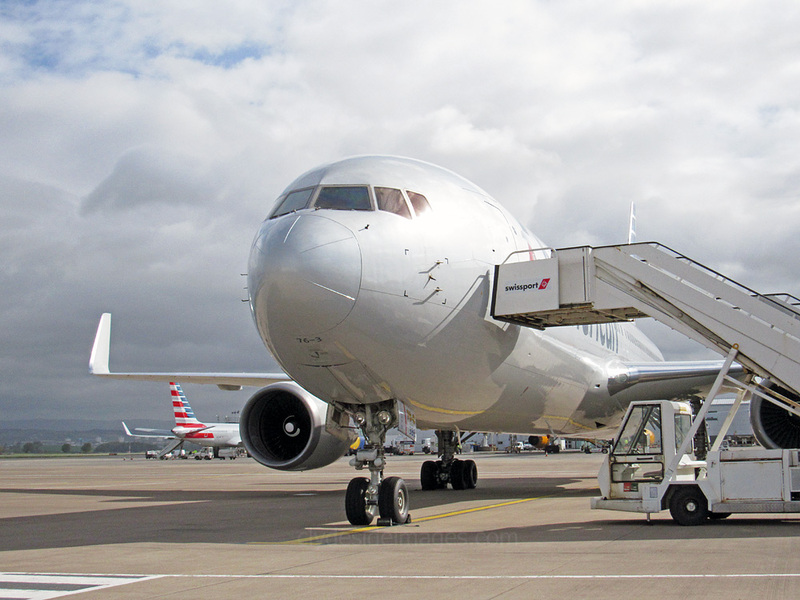 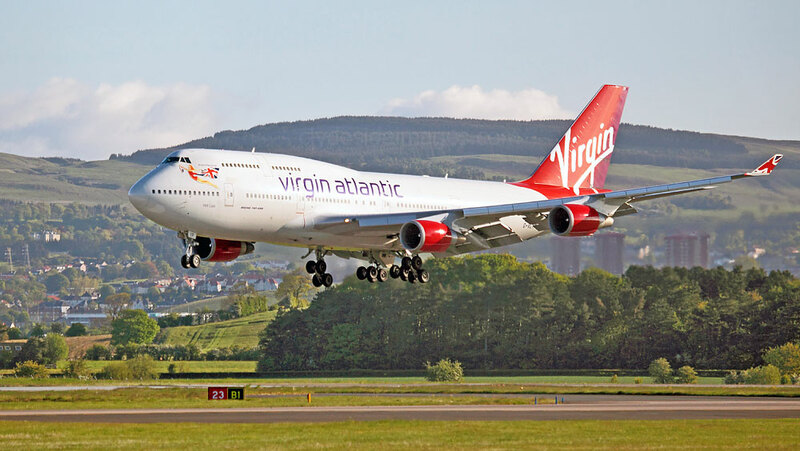 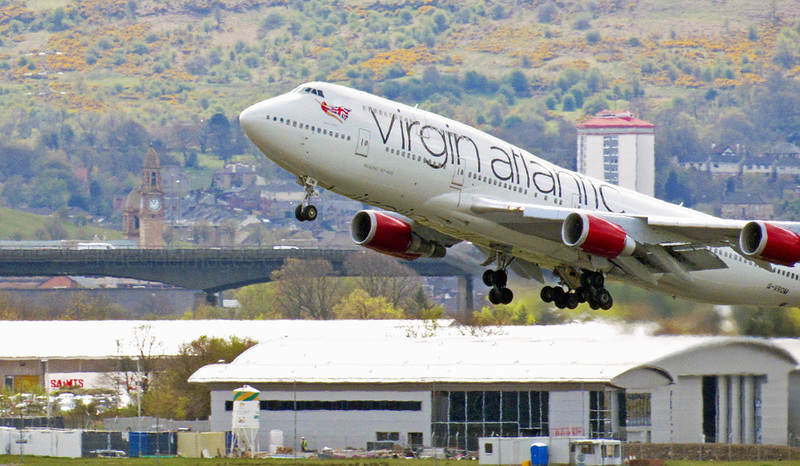 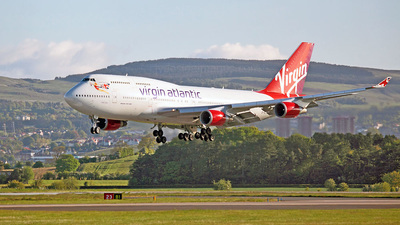 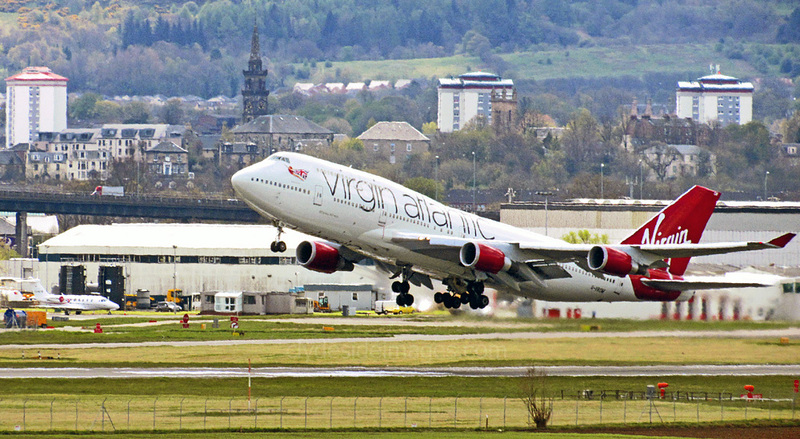 The volume of flights began to pick-up this month and the Virgin Atlantic Jumbos and Thomson Dreamliners made a welcome change from the regular Airbuses and Boeing 757s. 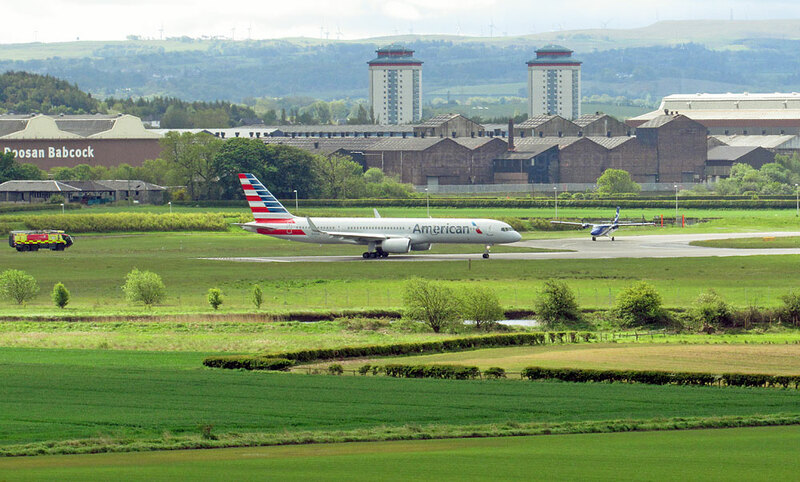 In the shot below, taken on May 1st, Boeing 747-443 `Barbarella` sets off for Orlando while work progresses on the new Scottish Air Ambulance hangar. 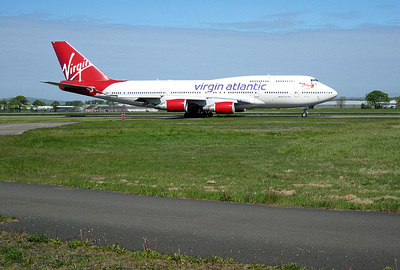 Please note that all images on this website are copyright. 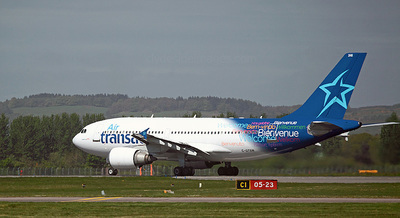 They are not free to use and have been embedded with a digital watermark. 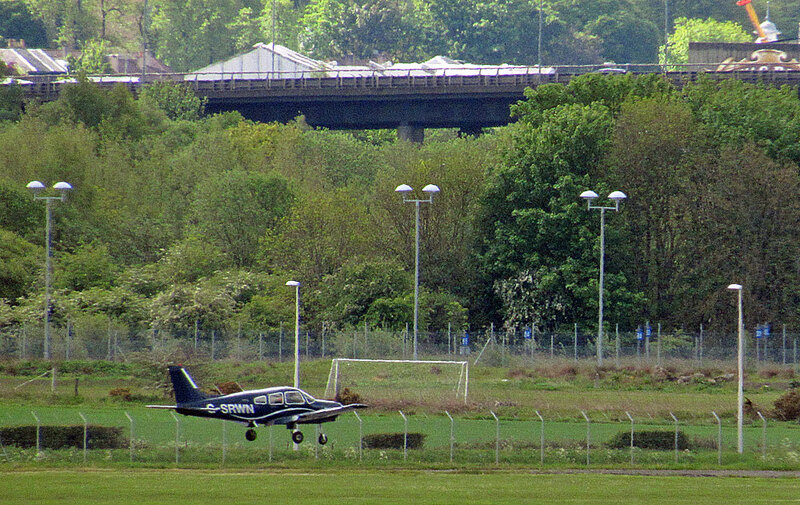 Above Left: Note the photographer in Inchinnan Road standing on top of an electrical junction box to avoid shooting through the mesh perimeter fence! 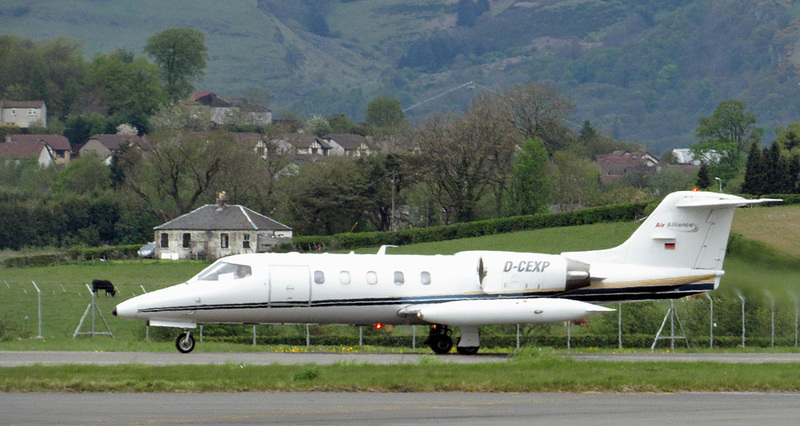 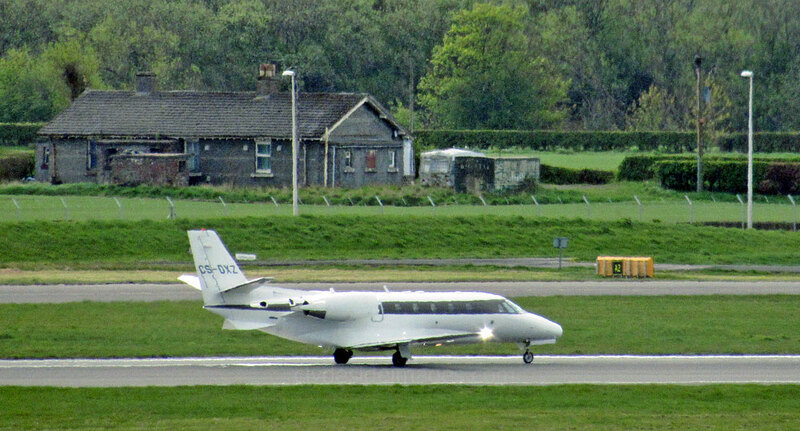 Noteworthy movements during May which evaded my camera lens included Cessna 560 Citation XLS CS-DXZ NetJets (1st); Learjet 35A D-CGRC (2nd); Embraer 505 CS-PHG, Learjet 35A D-CFTG, Beech 300 King Air VP-BMK (4th); Cessna 525A CitationJet CJ2, G-POWG Titan Airways, Falcon 2000EX N659FM (5th); King Air M-WATJ (6th); Airbus A320-232 HA-LPK Wizz Air - first visit, Boeing 767-3W N386AA American - technical diversion (Frankfurt>Dallas) due to an engine problem, Learjet 35A D-CCCB, Beech C90A N750XP, Citation Excel G-CHUI, Socata TBM900 N900AT, DHC6-400 C-GLVA, all on the 7th. 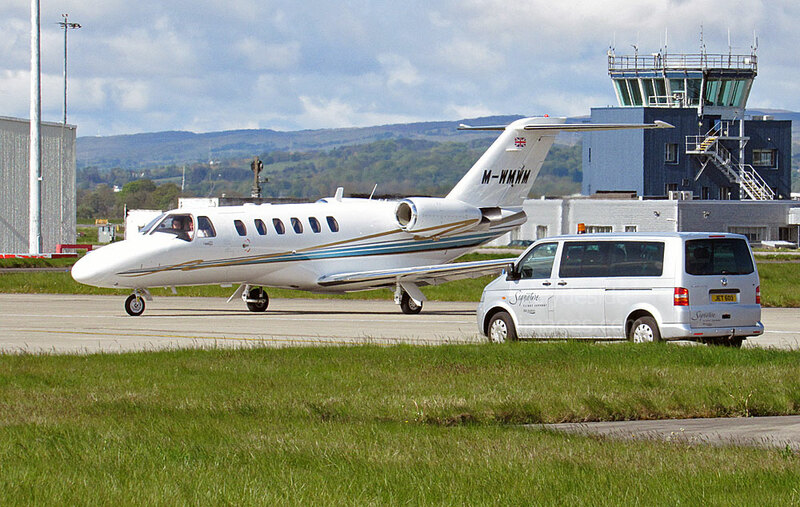 ​Pilatus PC-12 M-YBLS and Embraer EMB-505 Phenom 300 CS-PHG (25th);​ Airbus A330-223 CS-TQW HiFly operating a Thomas Cook flight, SOCATA TBM-900 N900FA and Challenger 350 CS-CHB NetJets Europe (27th);​ PA-28 Cherokee Archer G-BSEU, Citation CJ3 G-YEDC, Beech King Air 200s G-BYCP and G-OLIV and Beech 90 G-ORTH (28th); Learjet 31A D-CGGG and Diamond DA42 Twin Star G-DGPS (29th); Boeing 737-73S(WL) F-GZTG Europe Airpost, Beech 200 King Air M-JACK, McDonnell Douglas MD-83 OY-RUE of Danish Air Transport on a Rugby charter, and British Midland`s Embraer ERJ-145EP G-RJXE (30th), Boeing 737-7CT(WL) C-GMWJ Westjet, Airbus A320-232 LZ-BHG Balkan Holidays, Cessna 425 Conquest N425FZ and Dassault Falcon 2000EX CS-DFF (31st). 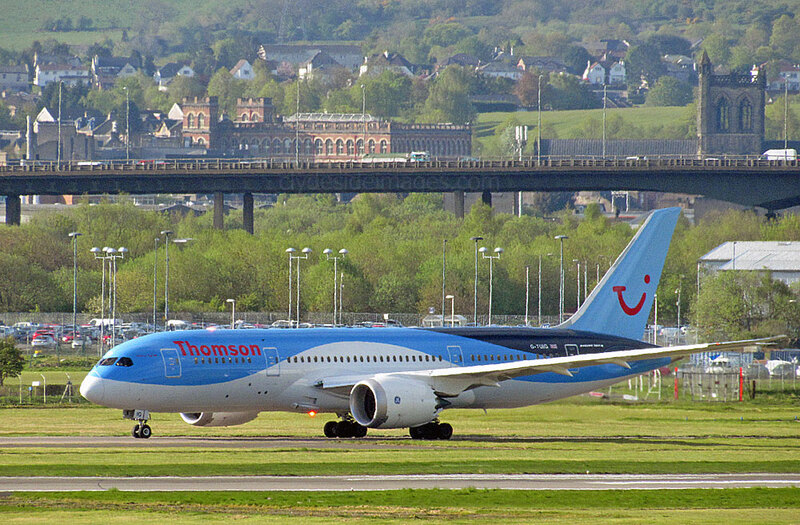 Thomson Boeing 787-800 Dreamliner G-TUIG. 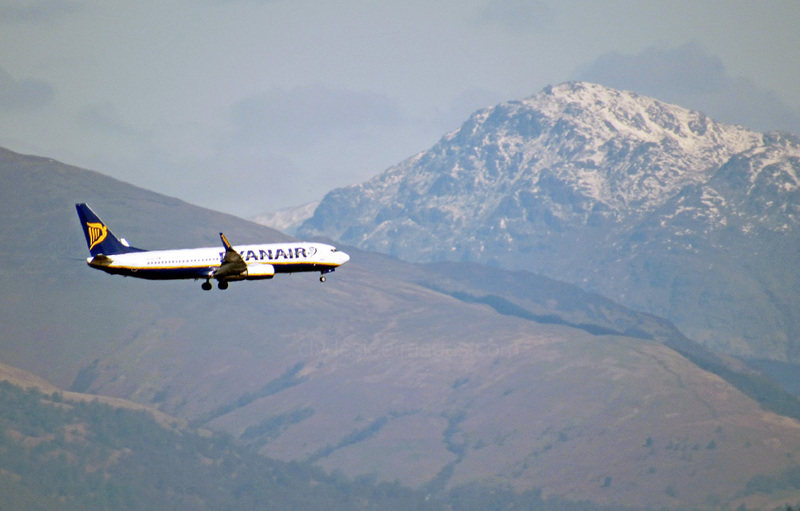 ​The first day of May marked the official end of the 2014/15 Ski Season but following a substantial dump of fresh dry snow over the preceding weeks, enthusiasts had been out on the slopes taking advantage of the superb conditions and welcome spring sunshine. ​Cairngorm continued to operate into May and although the southern Munros received only a dusting compared with the higher ranges to the north, it was enough to create an almost alpine backdrop for aircraft on approach when runway 05 was in use. 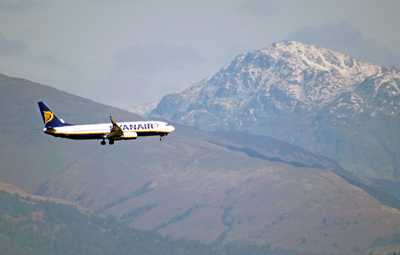 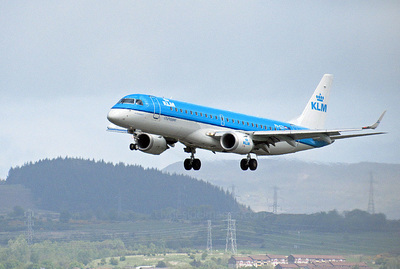 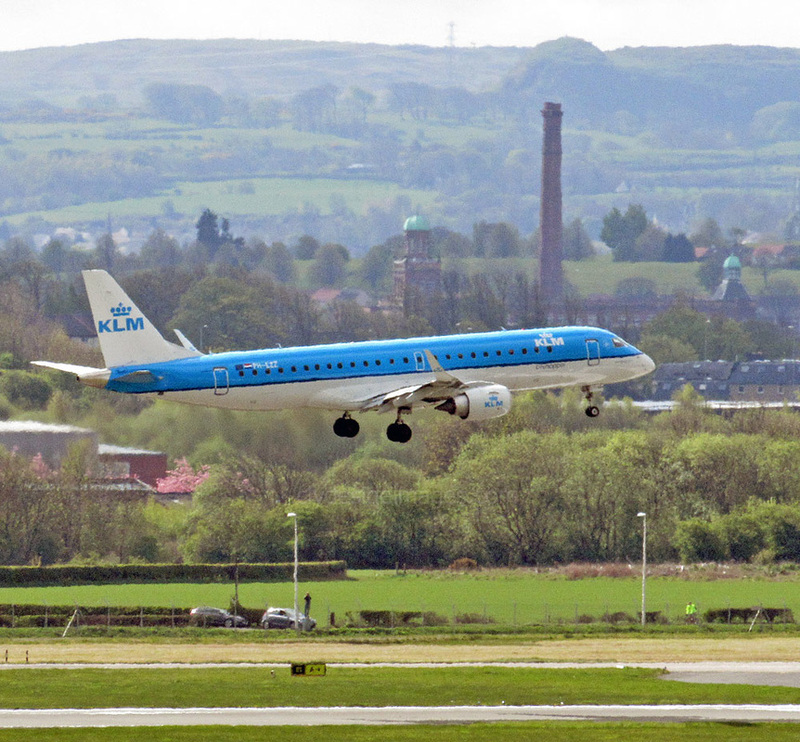 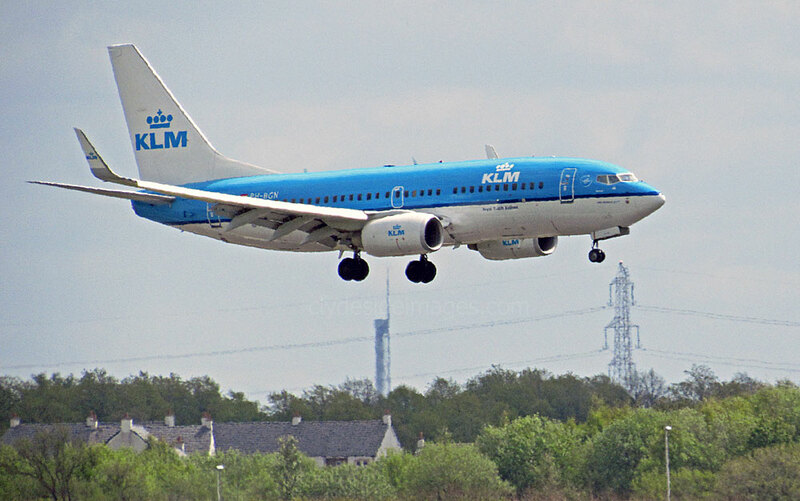 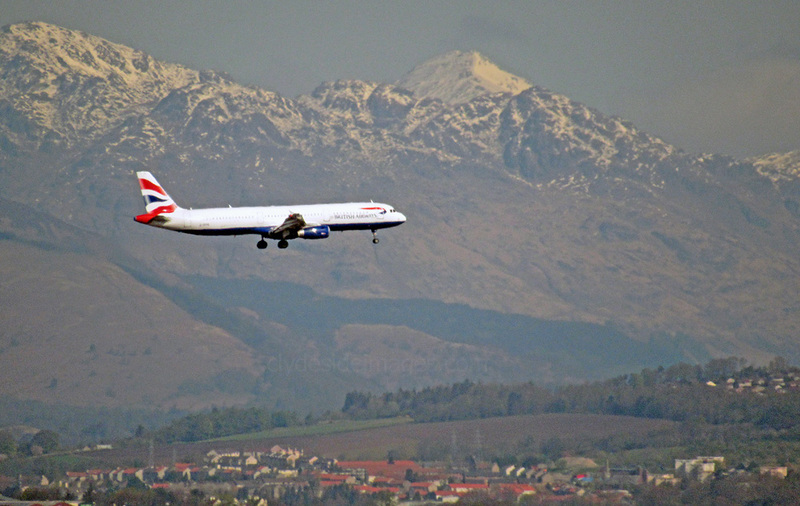 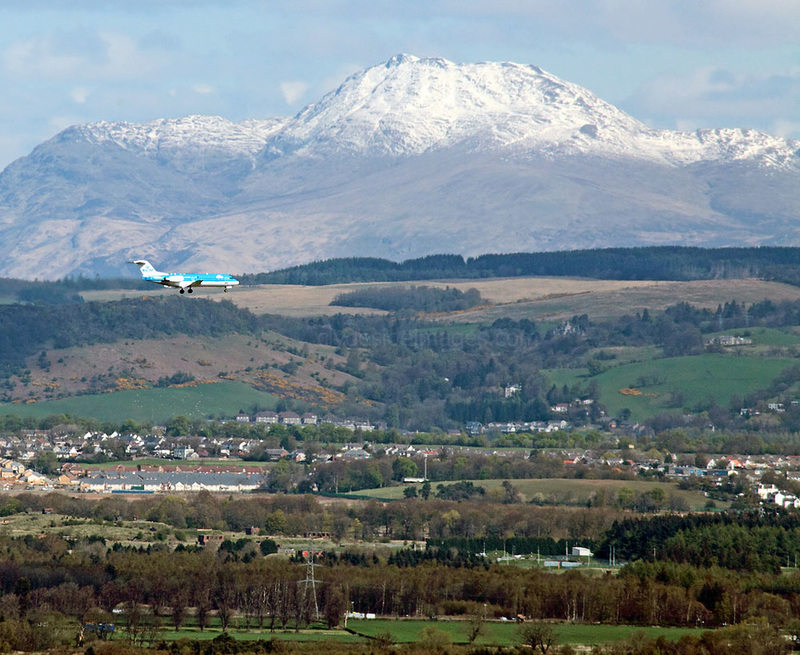 ​Pictured here on finals is KLM Cityhopper Fokker 70 PH-KZK with Ben Lomond, Scotland`s most southerly Munro, (a peak that attains or exceeds 3,000ft / 914m) towering above. 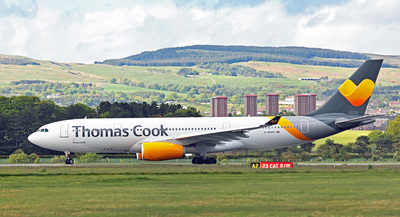 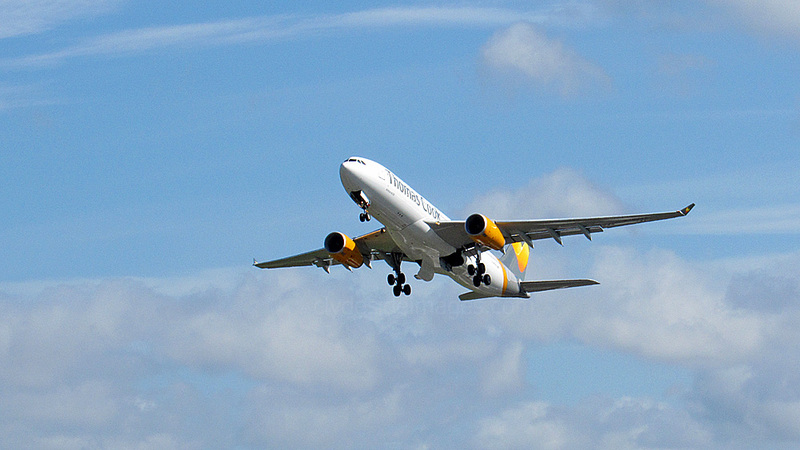 Thomas Cook Airbus A330-200 OY-VKF with `Scandinavia` titles was brought in to help cope with the large amount of holidaymakers heading for the sunshine. 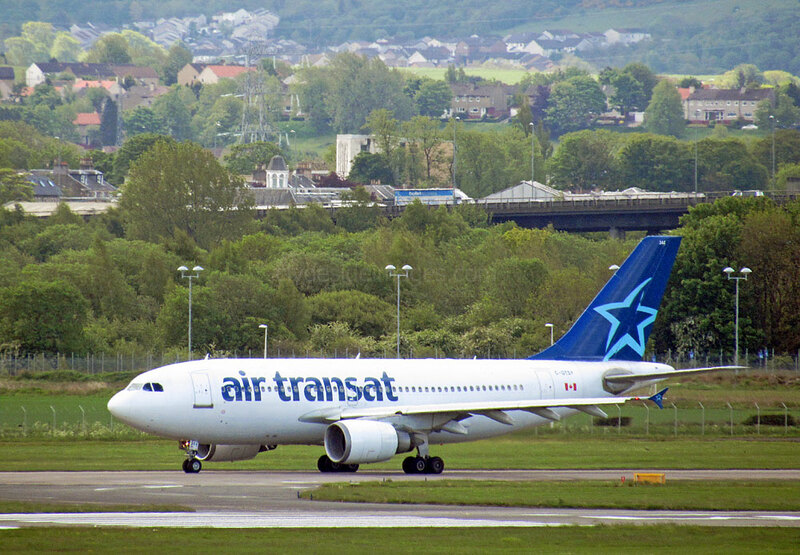 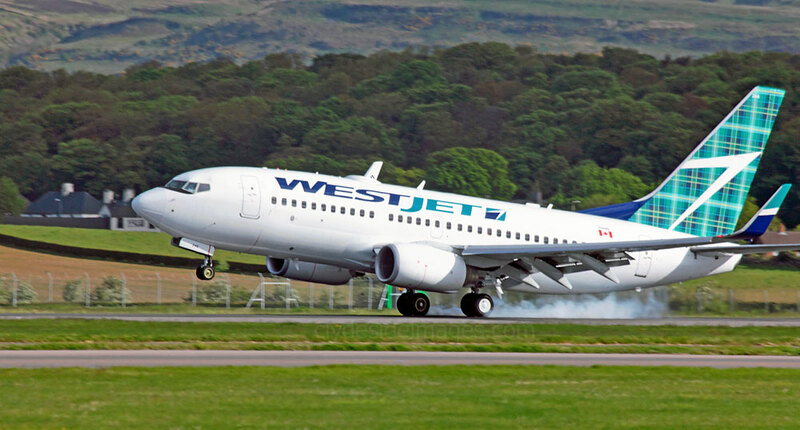 ​Saturday 30 May was fairly busy movement-wise and saw the start of the daily Westjet service between Glasgow and Halifax, Nova Scotia. 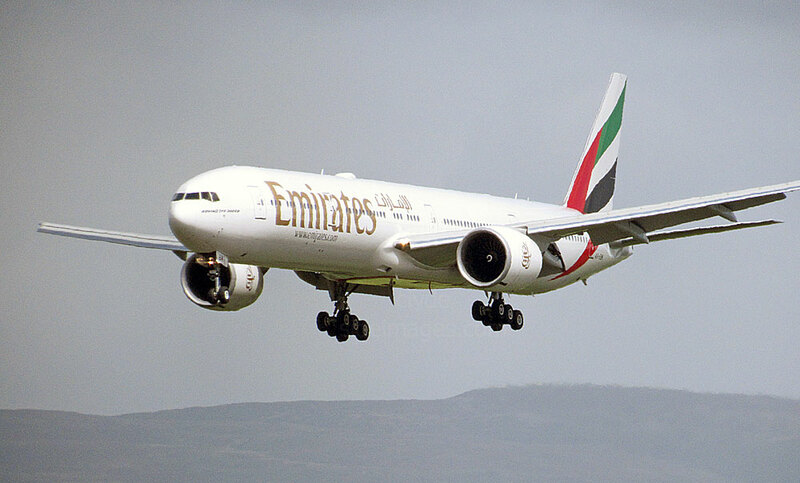 The non-stop flight, which has a journey time of just 5 hours 15 minutes, continued until October 24, 2015. Passengers were able to access Westjet's extensive North American route network with connections to Montreal, Ottawa, Winnipeg, Calgary, Edmonton, Vancouver and 16 other cities. 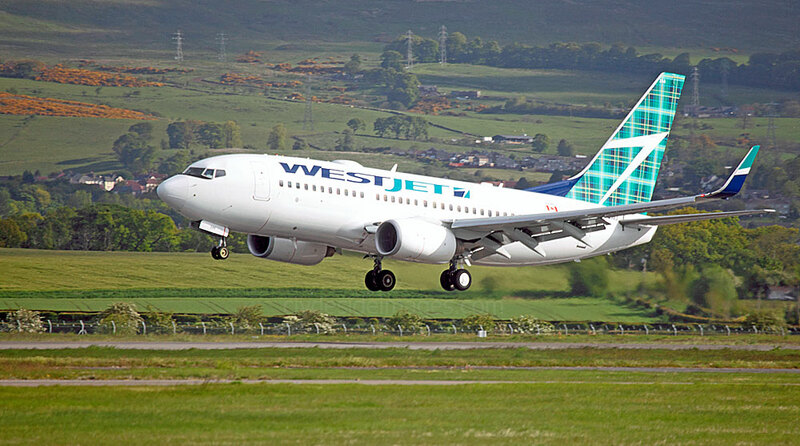 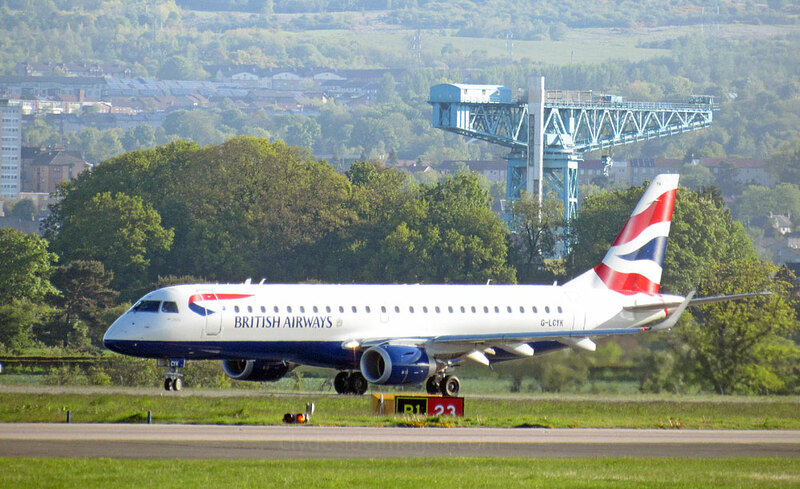 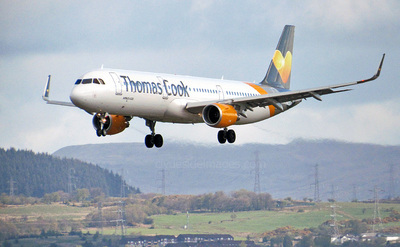 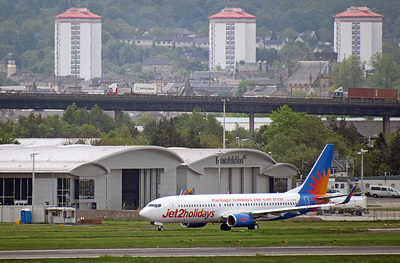 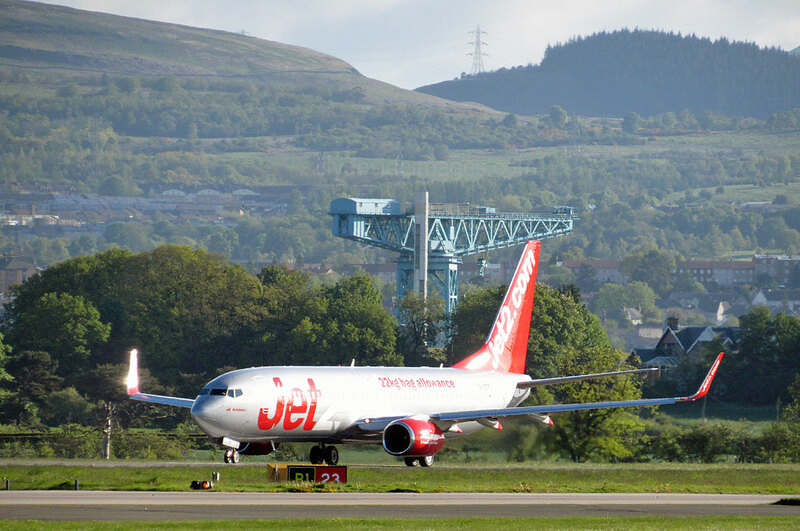 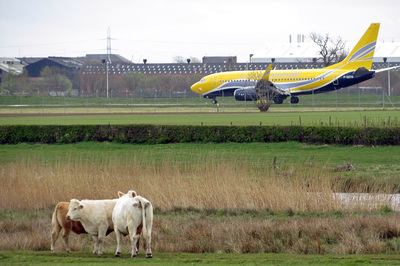 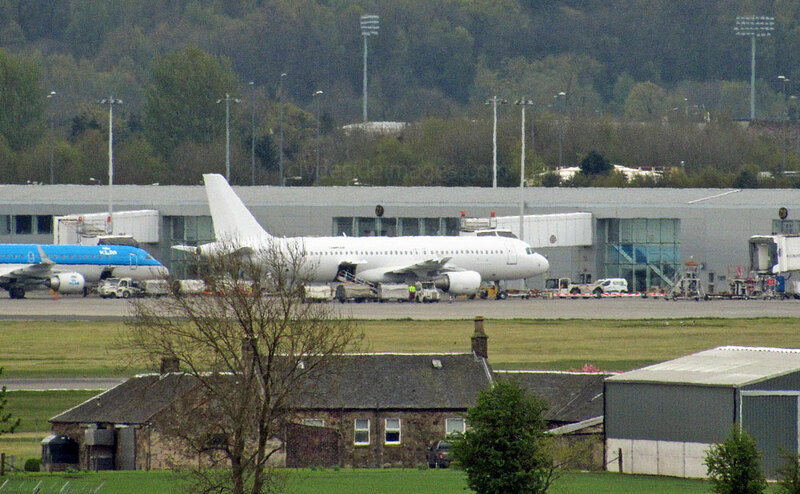 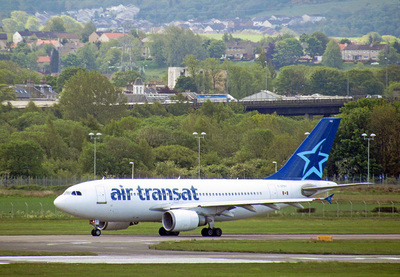 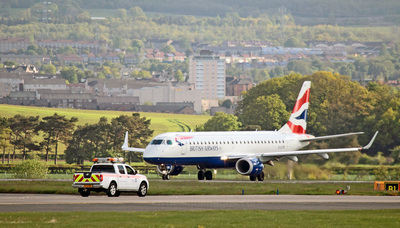 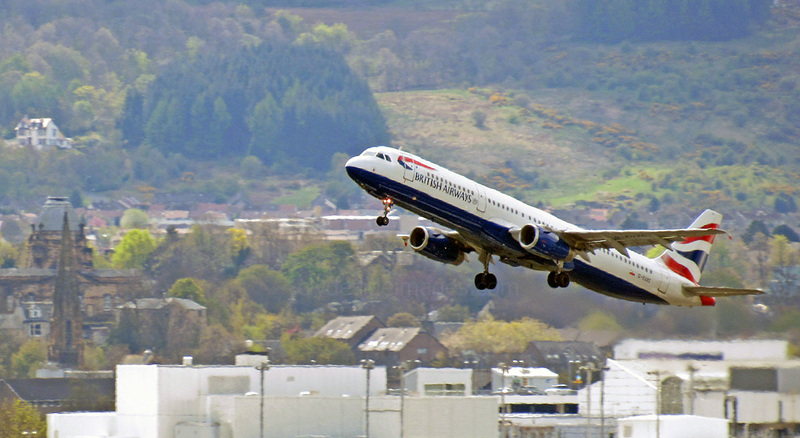 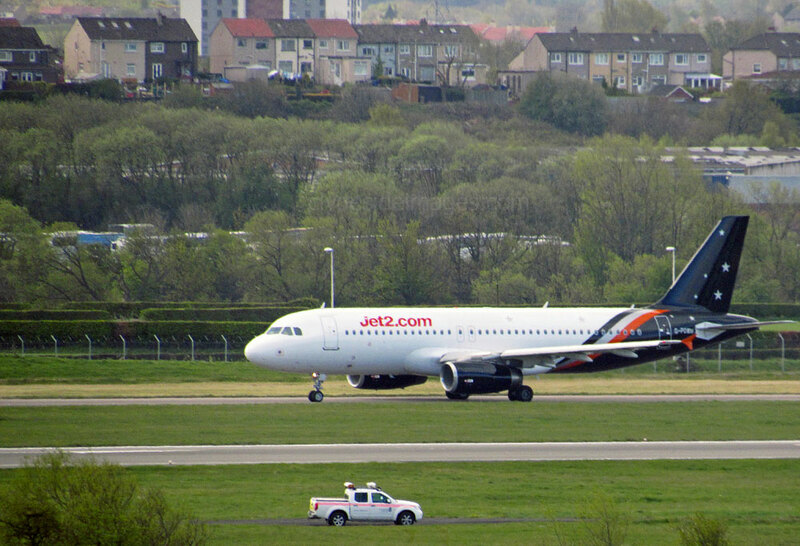 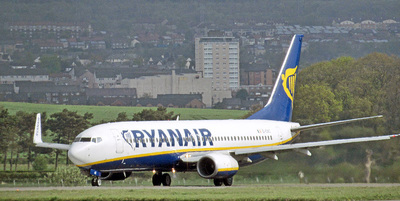 Aircraft designated to operate on the Glasgow route, like Boeing 737-700 C-GQWJ which was the first to arrive, had all been specially painted with a `Westjet tartan` tail. 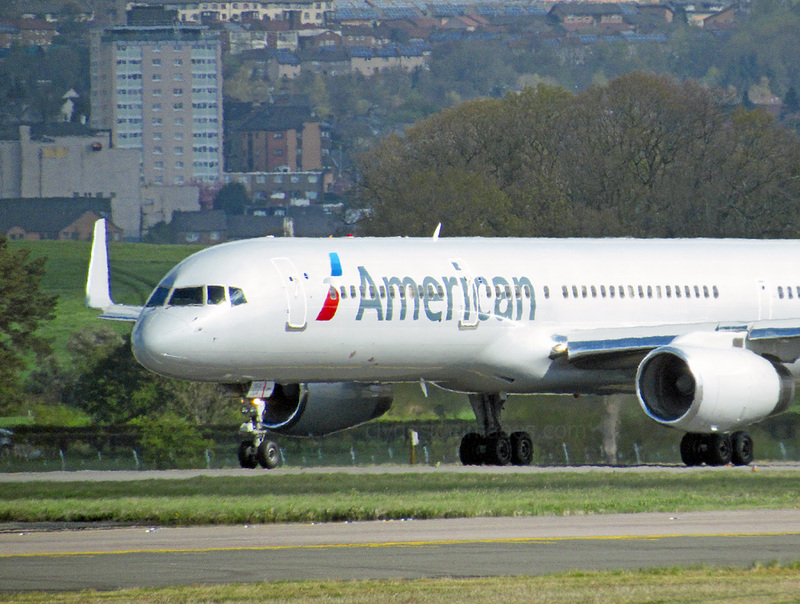 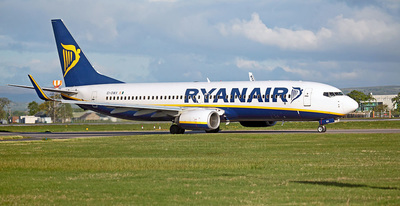 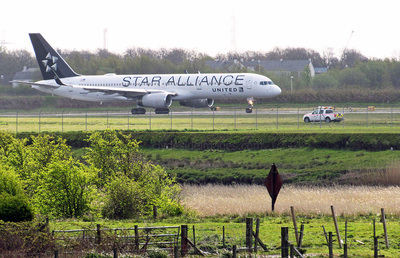 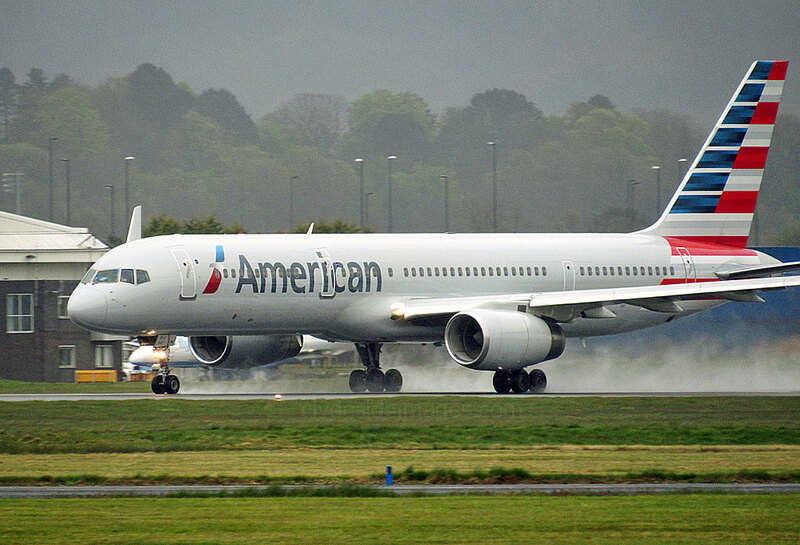 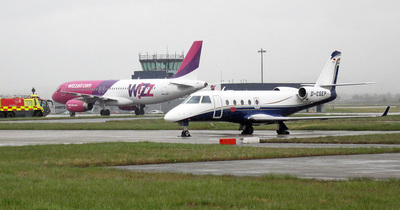 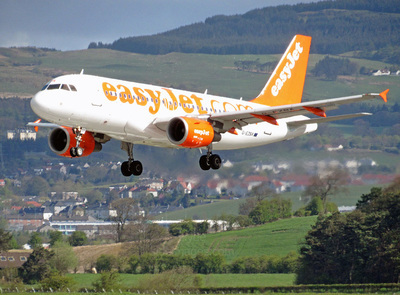 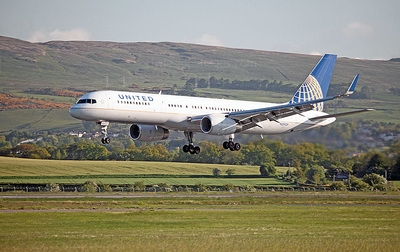 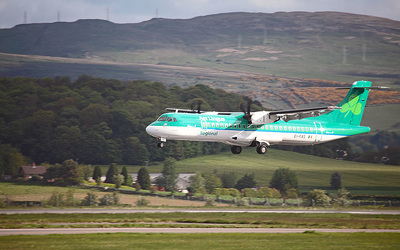 This is the airline`s first route to and from an airport in the UK and only its second transatlantic service following the launch in 2014 of direct flights to Dublin. 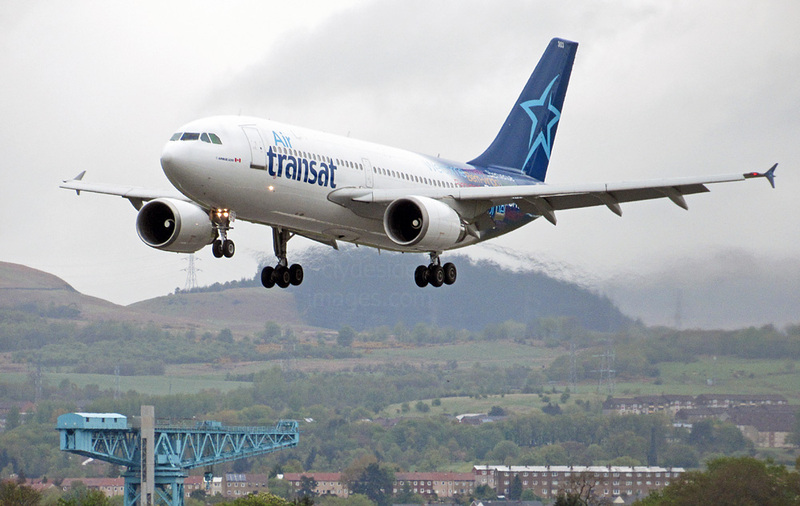 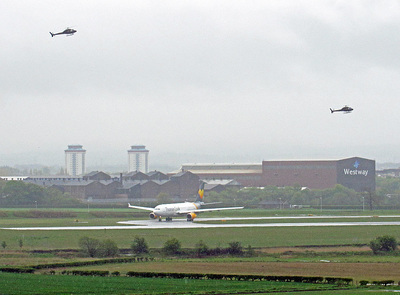 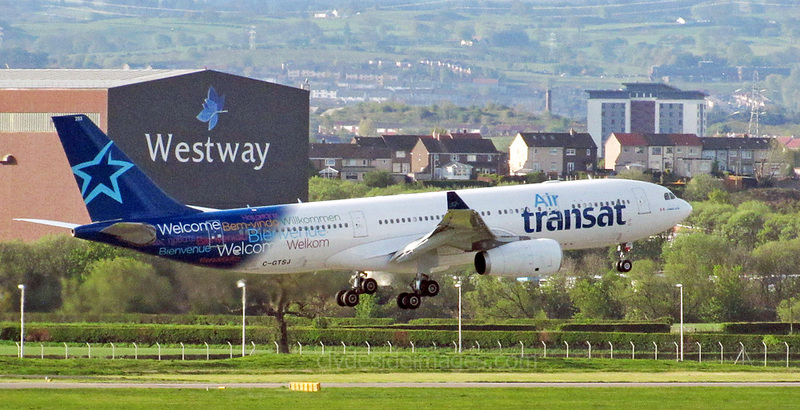 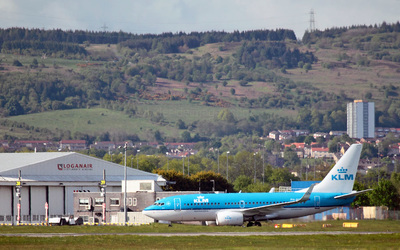 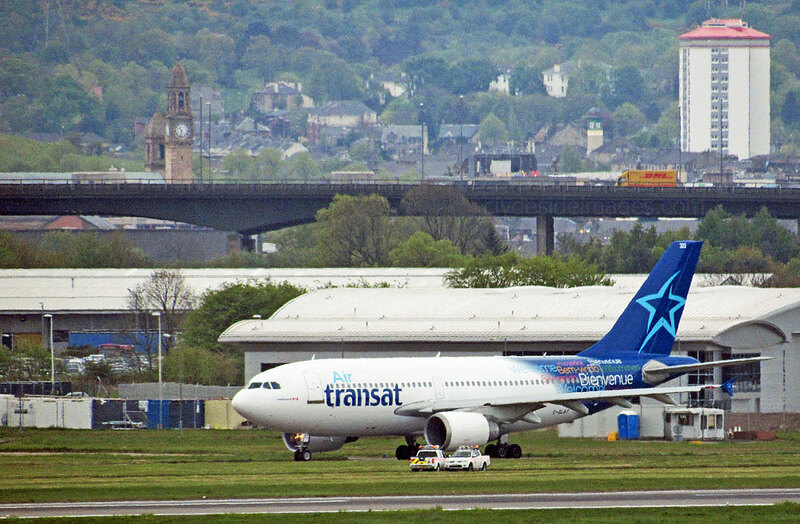 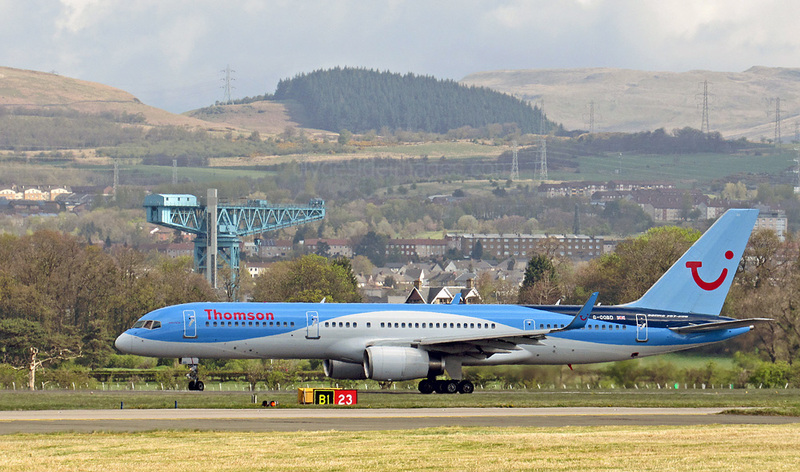 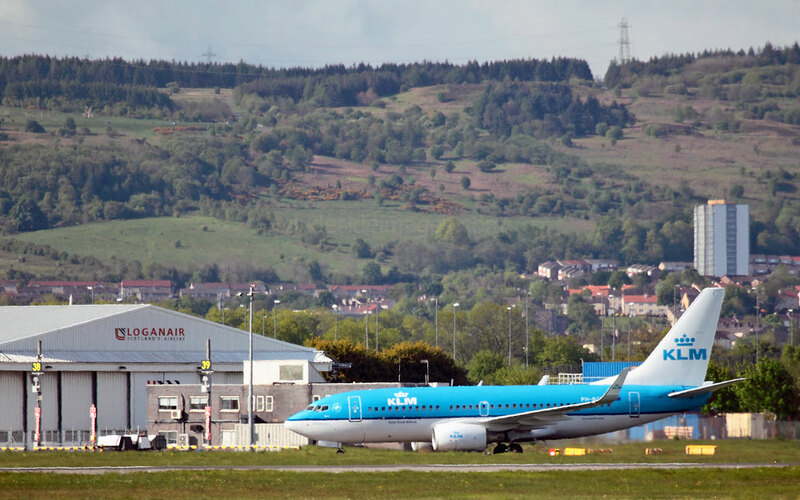 Dignitaries including the Premier of Nova Scotia, the Canadian High Commissioner to the UK, and the Mayor of Halifax were on-hand at Glasgow Airport to wave off the inaugural flight. 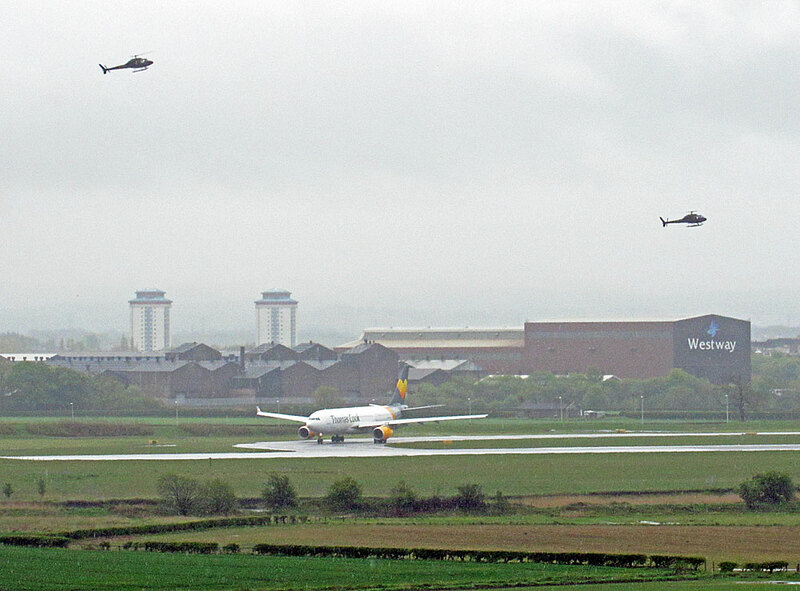 I`m not sure whether they were also part of the welcome party when the jet arrived at 8am - maybe they were all having a lie-in! 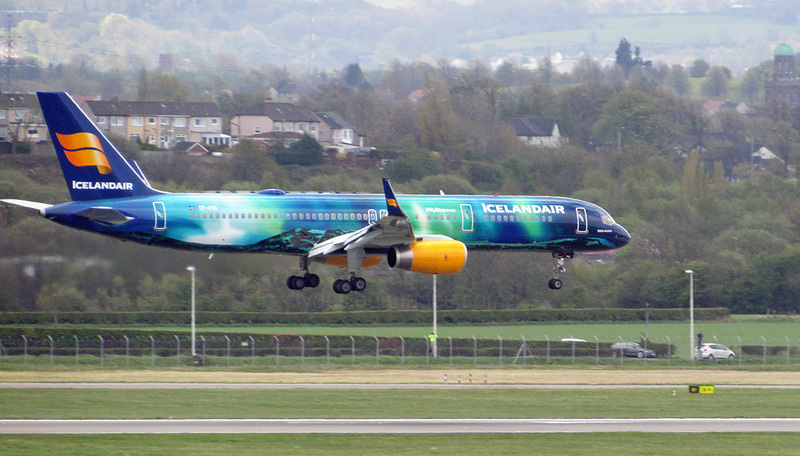 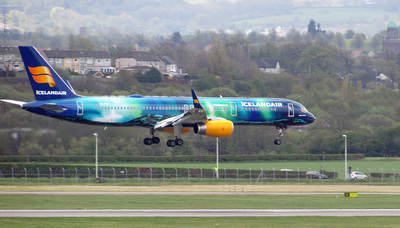 This is Icelandair`s Boeing 757-256(WL) TF-FIZ descending for Runway 05 on 1 May. 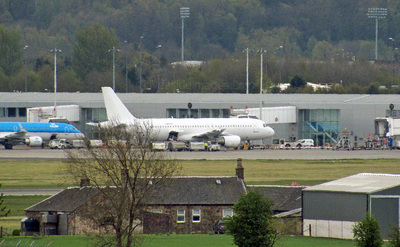 Boeing 737-8KN A6-FEX, on delivery from the manufacturer`s factory at Boeing Field, Seattle, to Fly Dubai, stopped-over on Saturday 30 May. 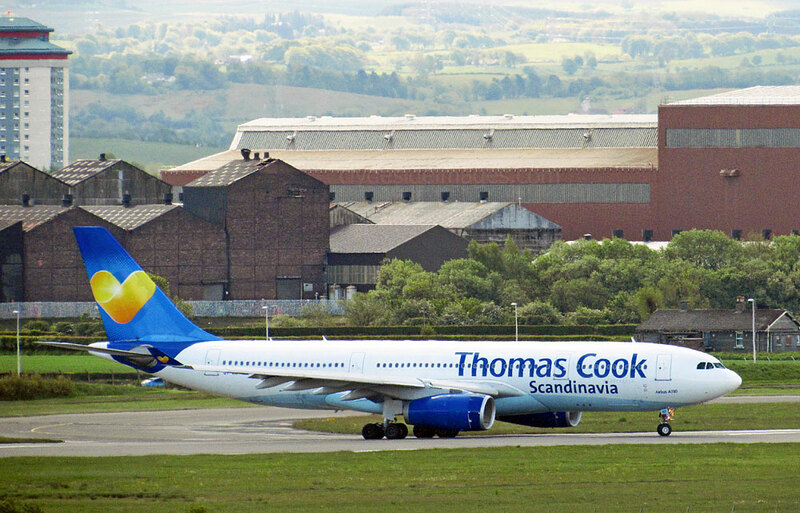 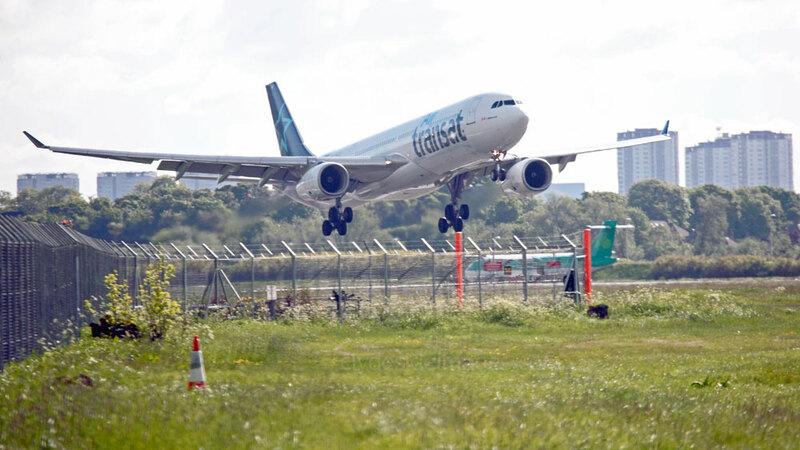 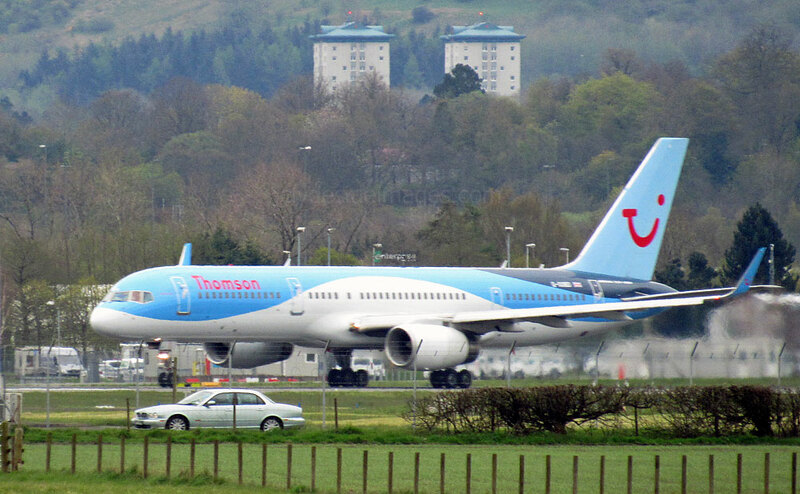 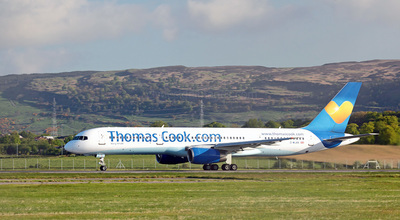 ​Hi-Fly Airbus A330-223 CS-TQW, seen here on Thursday 28 May, was drafted in the previous day to cover after a Thomas Cook flight `went tech`. 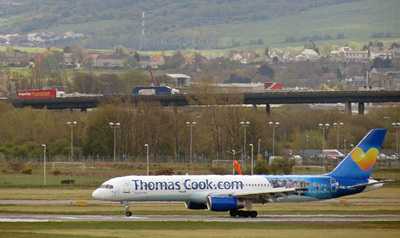 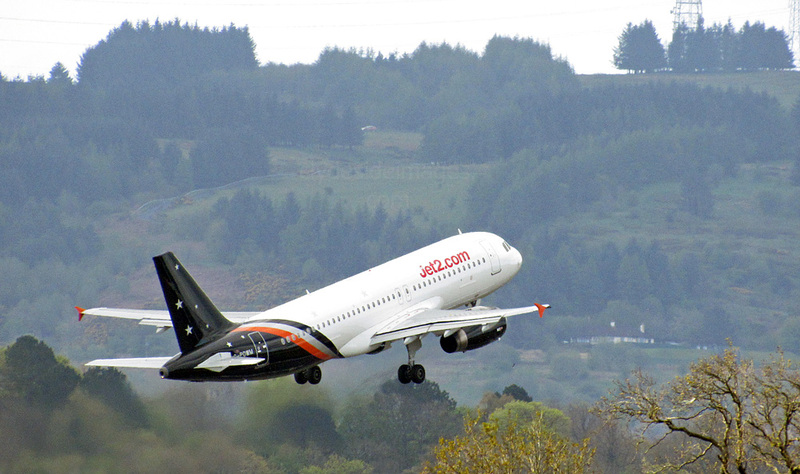 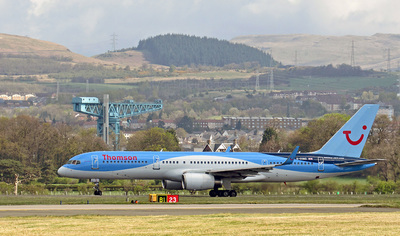 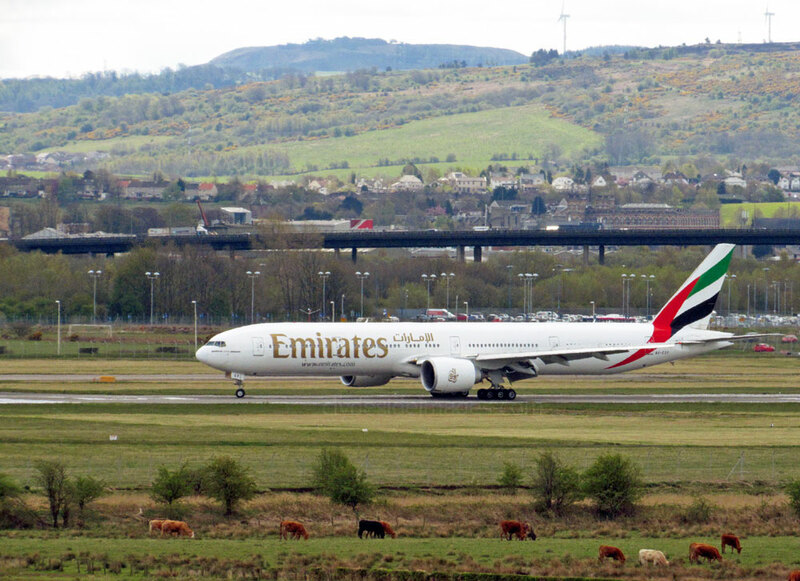 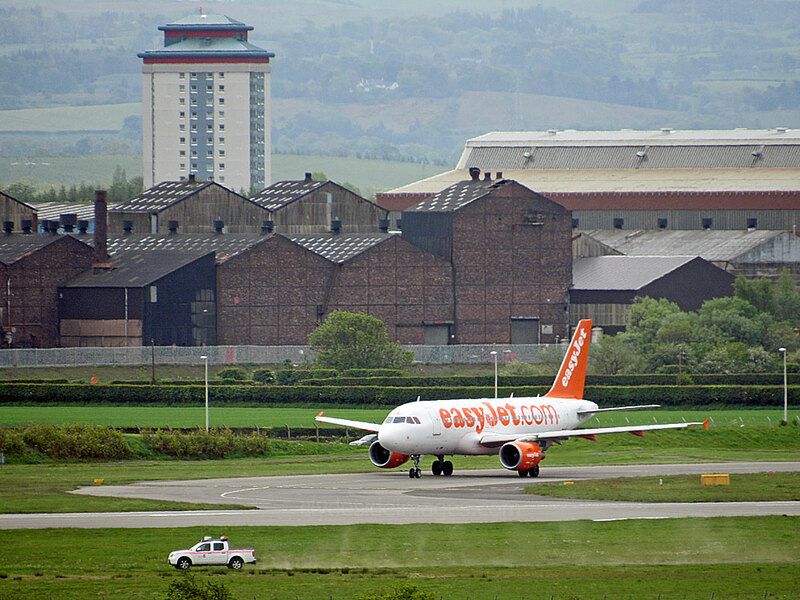 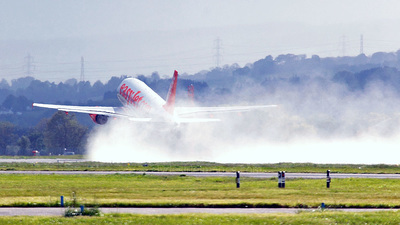 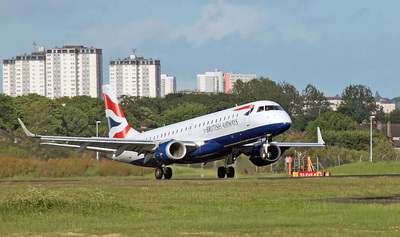 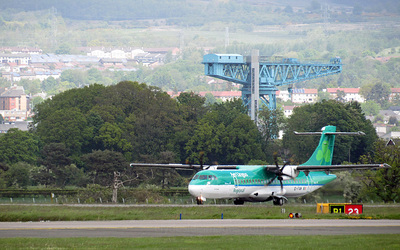 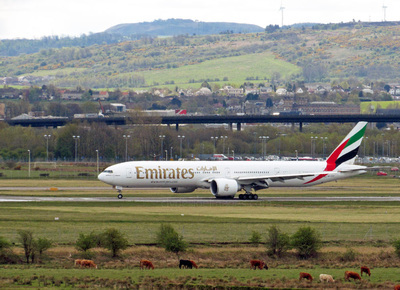 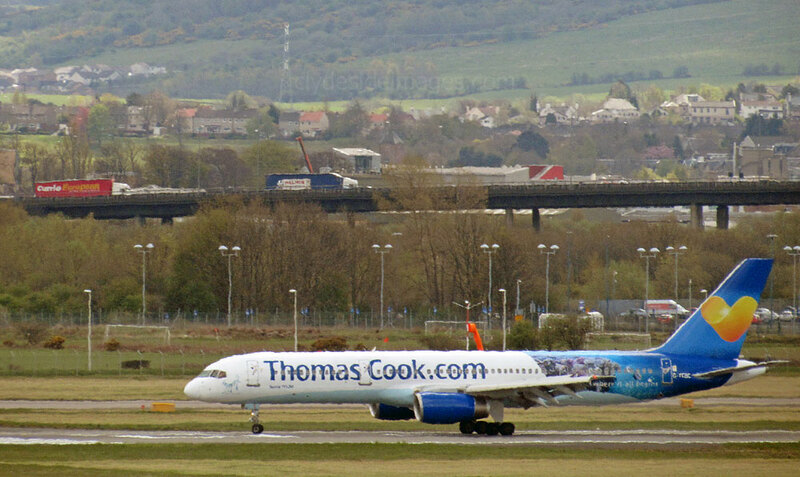 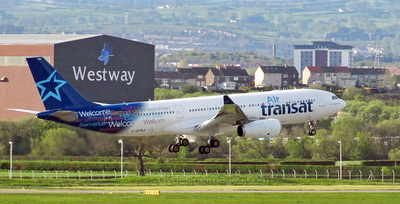 The Portuguese-registered airliner was making its first visit to Glasgow. 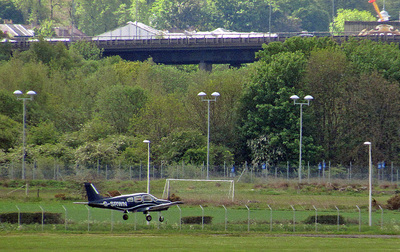 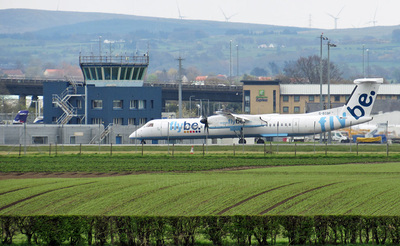 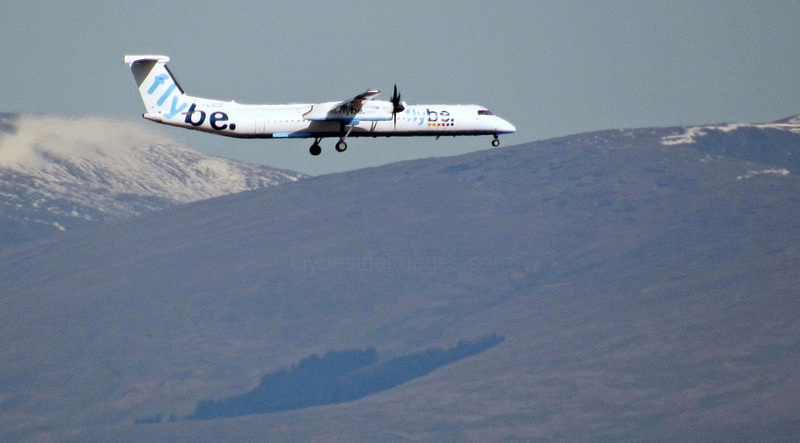 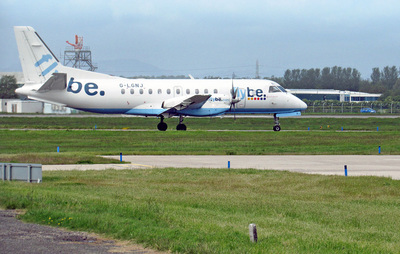 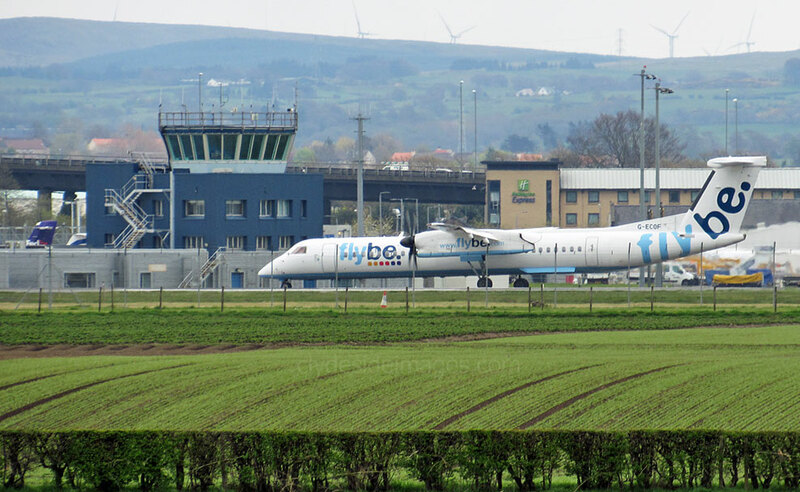 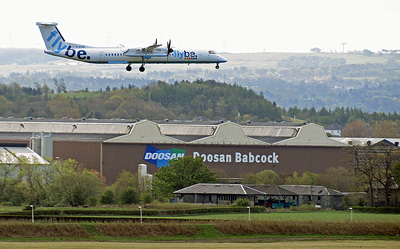 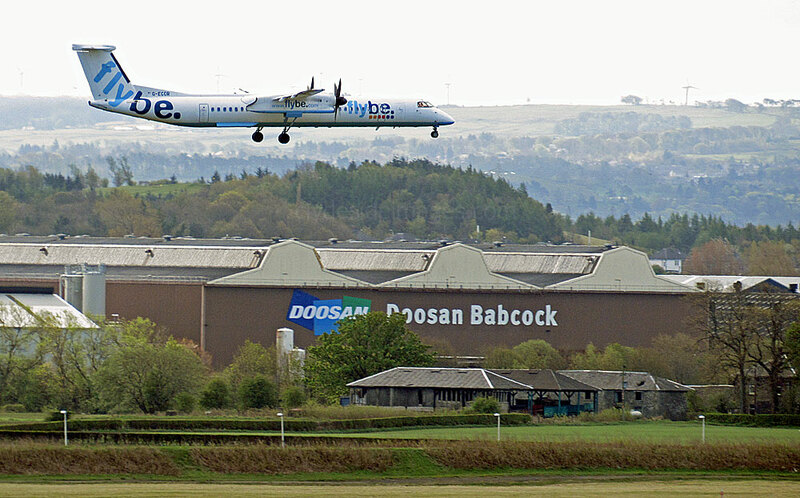 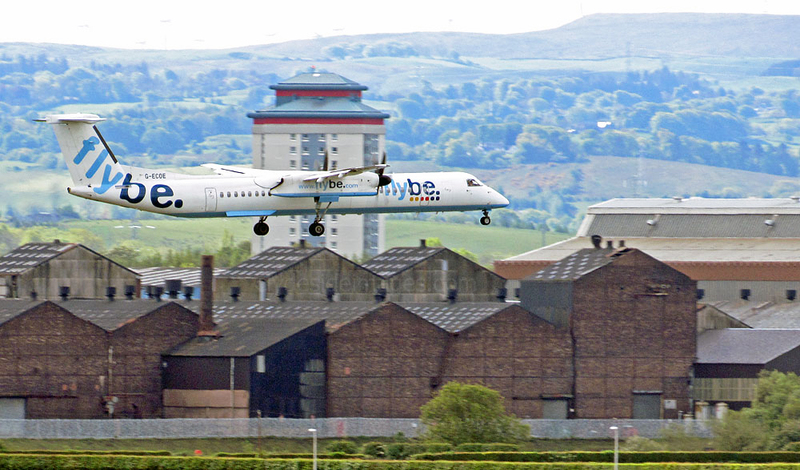 Flybe Dash 8 G-ECOE about to land on Runway 23. 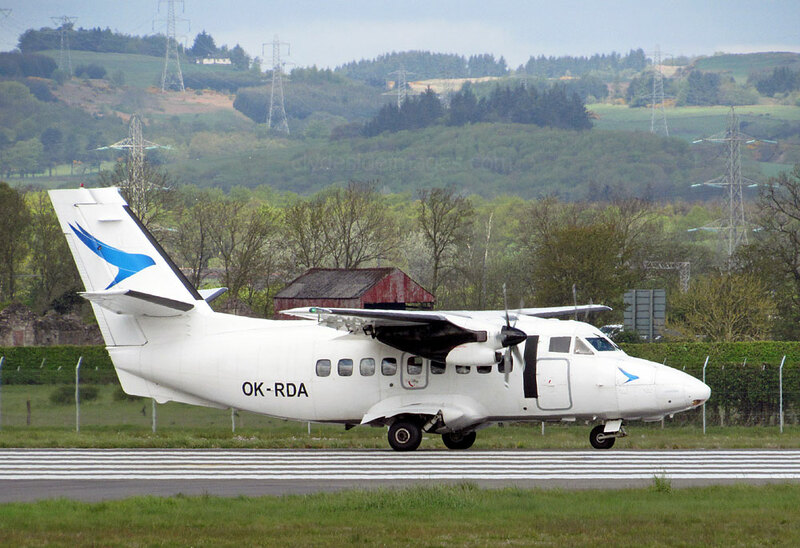 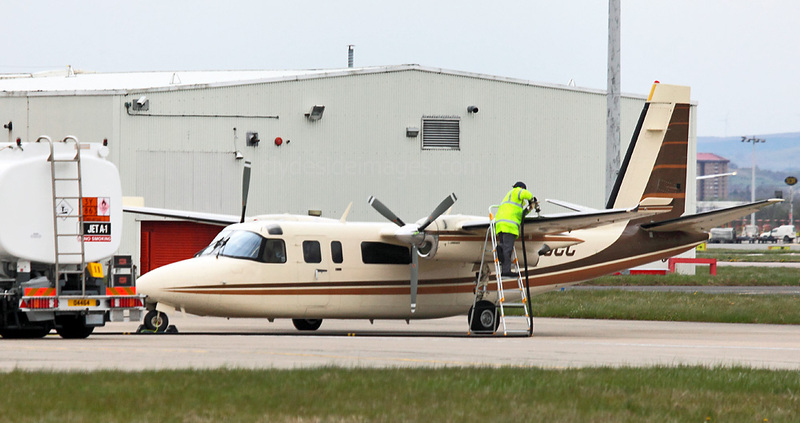 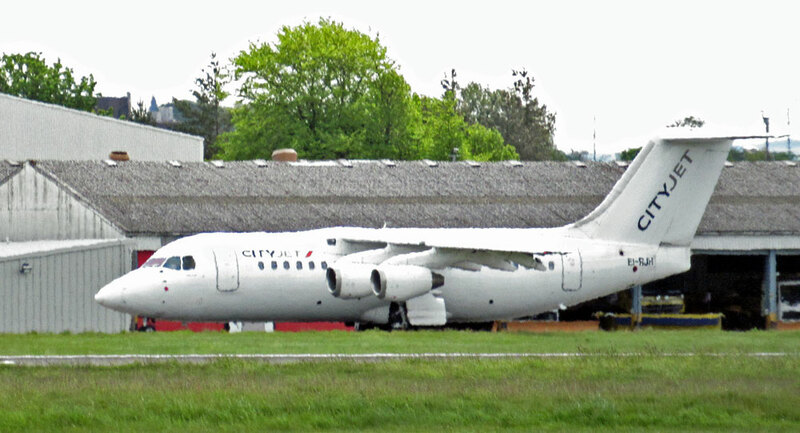 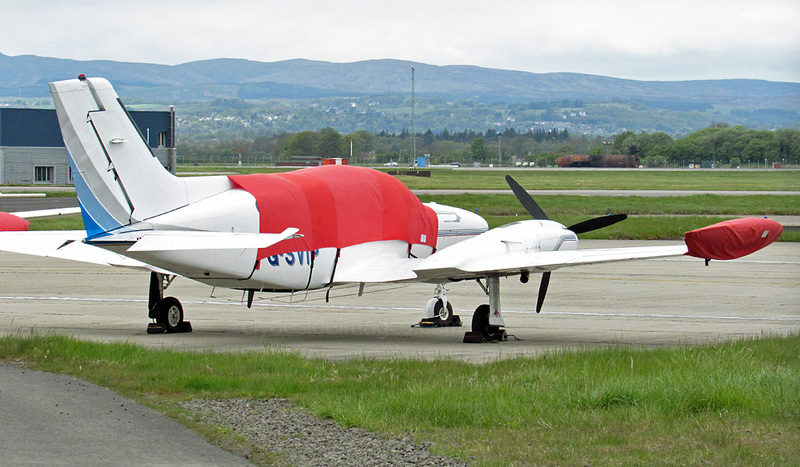 ​CDHC6-400 Twin Otters C-FVIK and C-GLVA had arrived on 7 May and 8th May respectively from Canada, on delivery to Loganair. 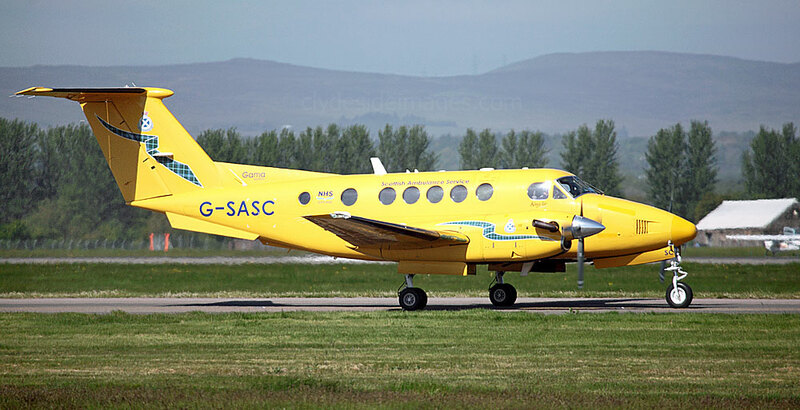 They have since been re-registered as G-HIAL and G-SGTS and following repainting in a blue & white `saltire` colour scheme they quickly became operational. 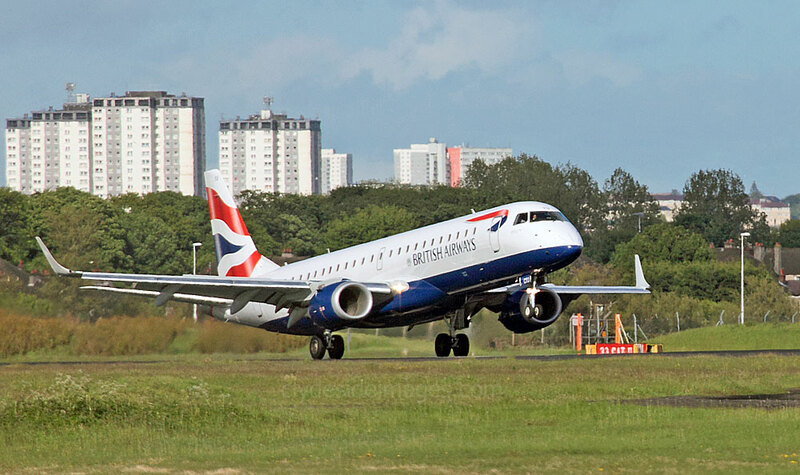 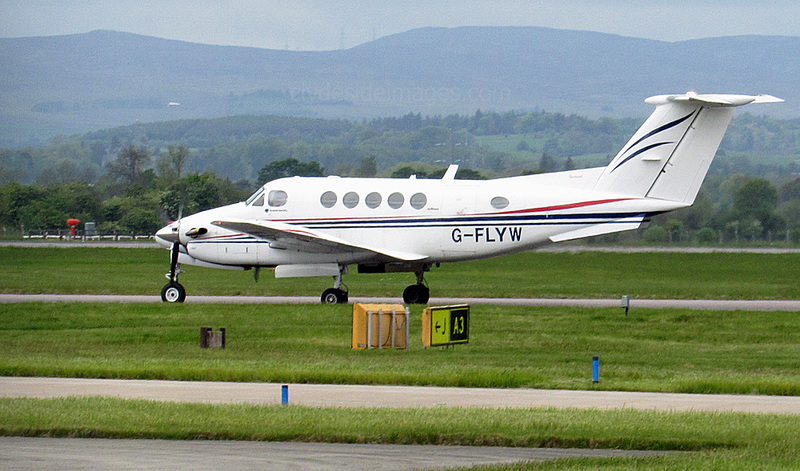 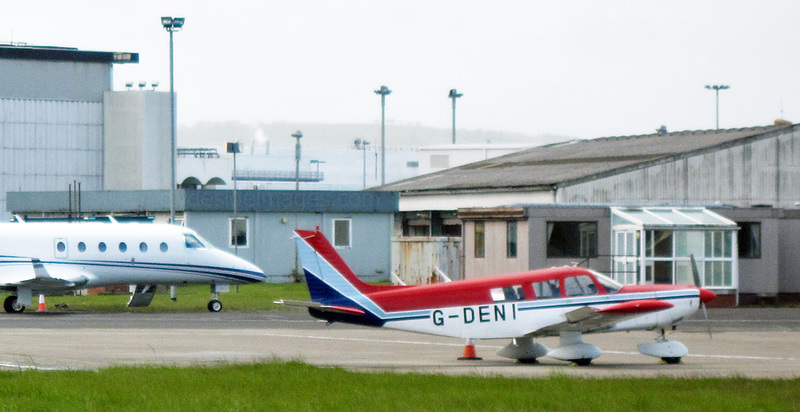 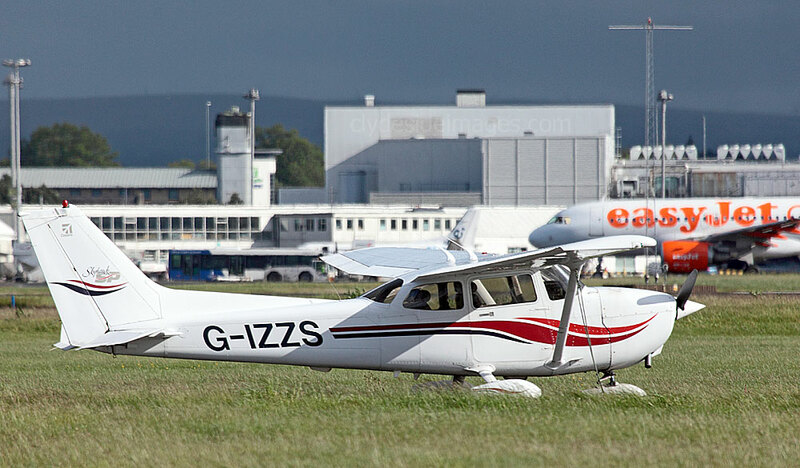 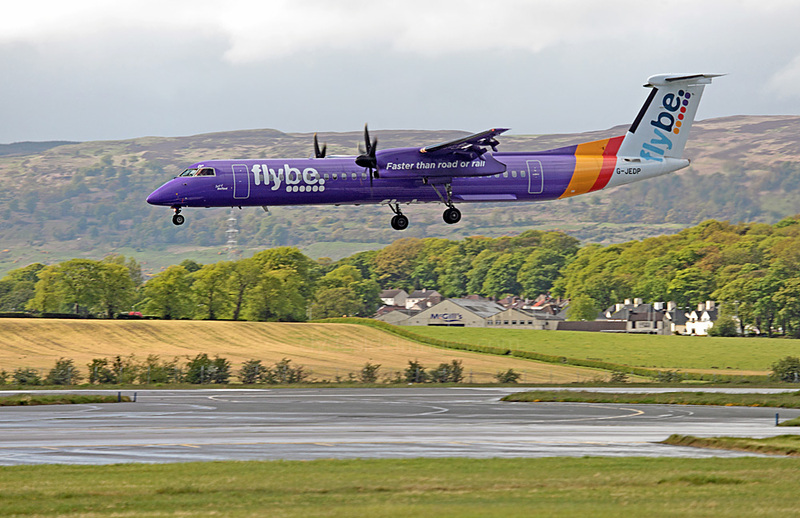 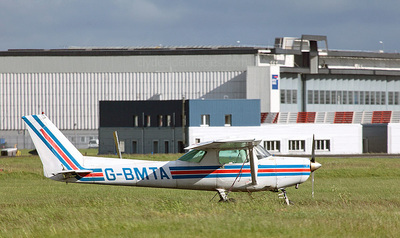 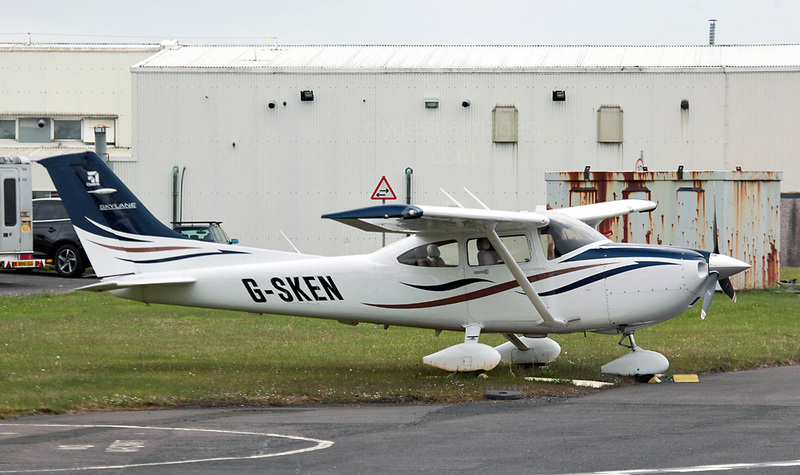 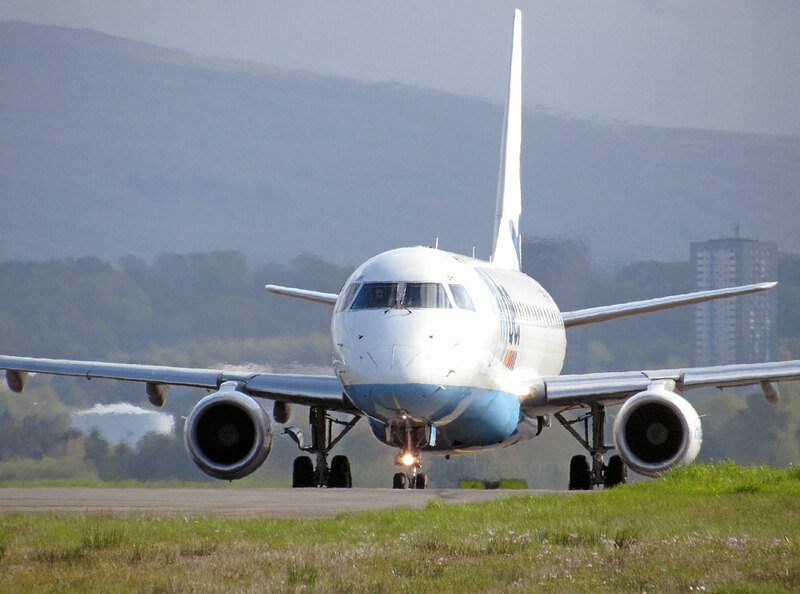 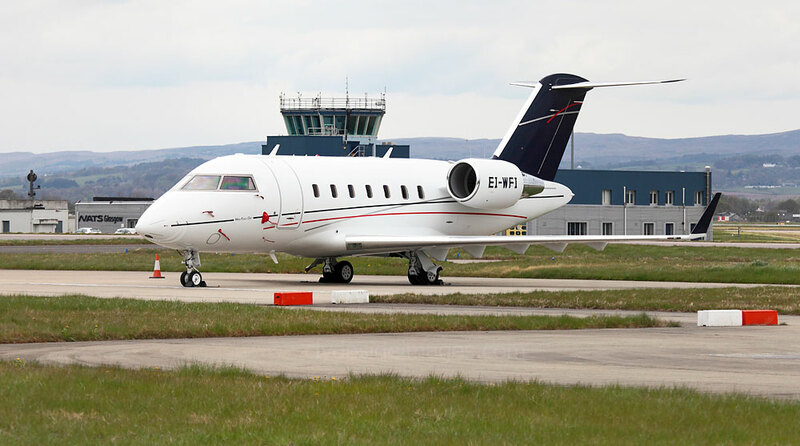 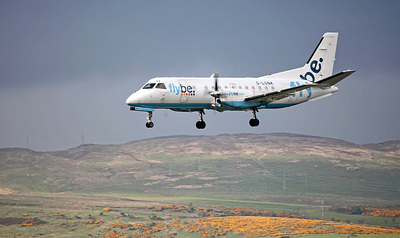 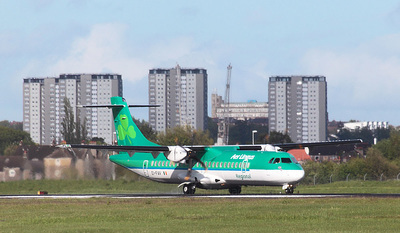 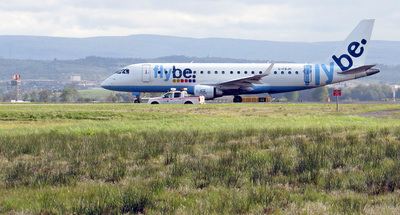 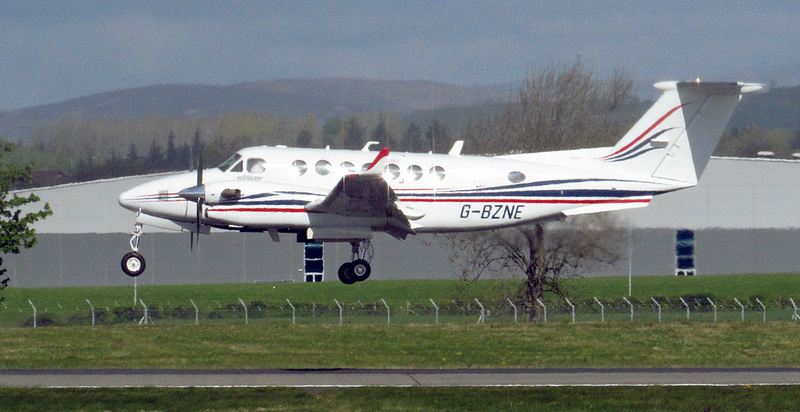 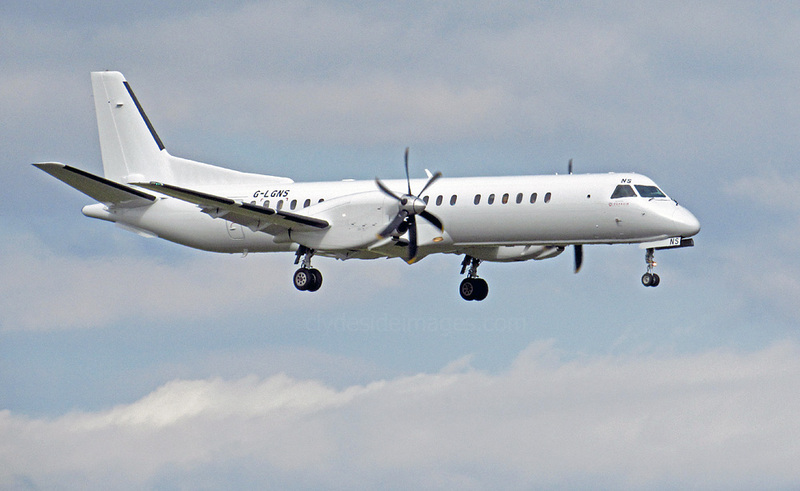 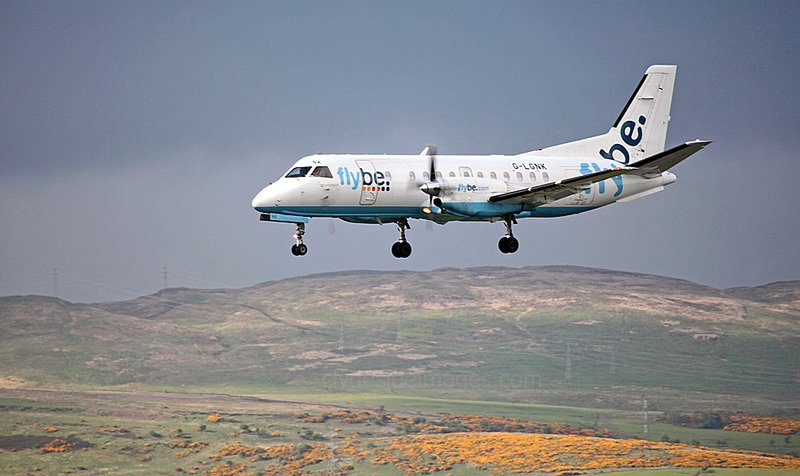 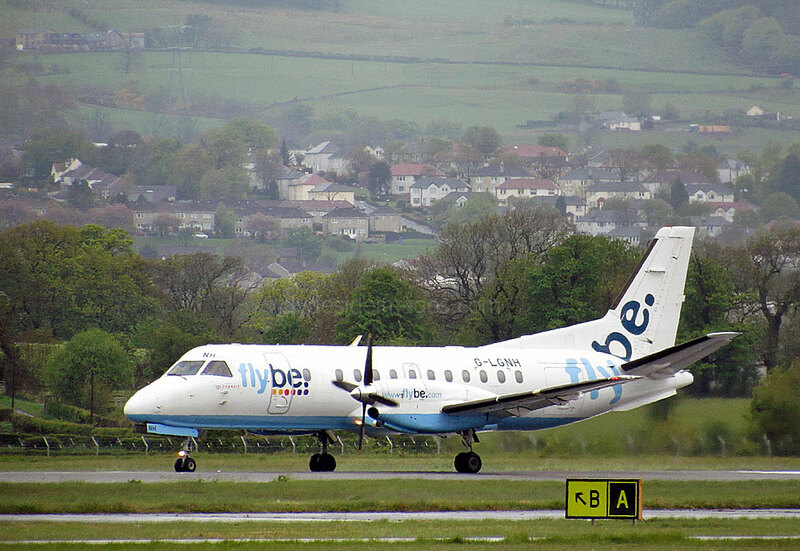 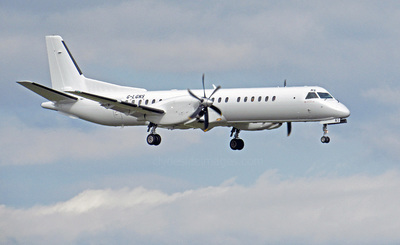 They will eventually replace the familiar workhorses G-BVVK and G-BZFP which currently fly routes to Barra, Tiree and Campbeltown and have been with the airline since October 2008. 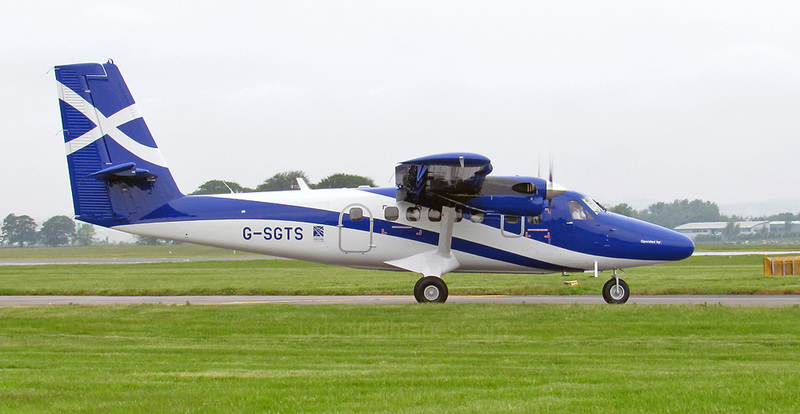 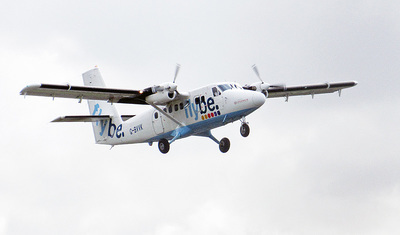 The Twin Otter is particularly ideal for the Glasgow to Barra service, the world’s only scheduled flight where the landing strip is the beach. The route is officially designated as a public service obligation (PSO) and would not be commercially viable without support from the Scottish Government. The contract to supply the new planes was awarded to Canadian company Viking Air Limited. 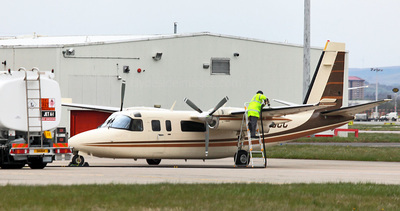 The intention was to have had the aircraft operational by April 2014, however, the process of purchasing them took longer than expected, mainly due to the massive order backlog of the Canadian firm, the only manufacturer of modern Twin Otter aircraft, who are based at Victoria Airport on Vancouver Island. 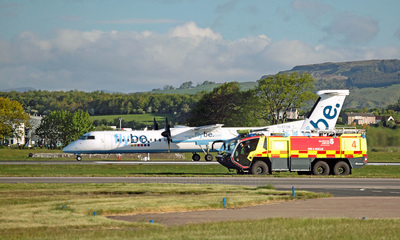 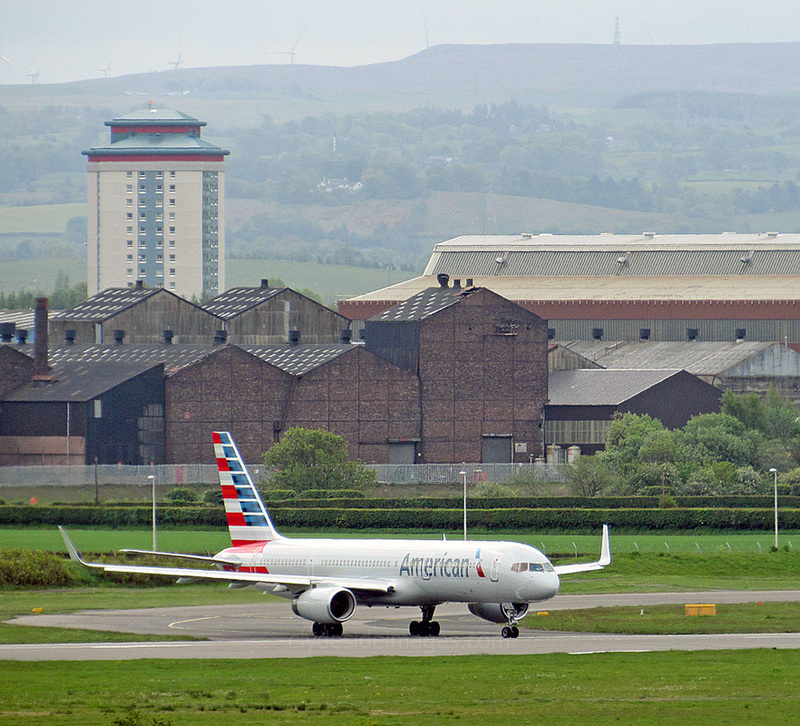 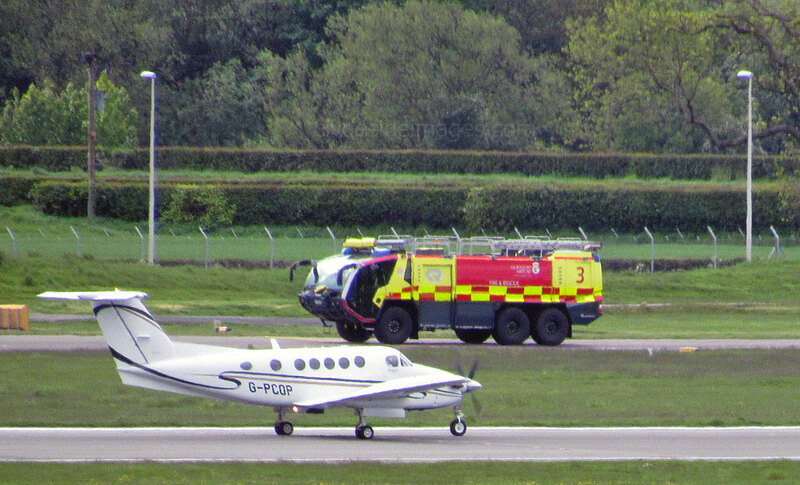 On Friday 29 May, one of Loganair`s new Twin Otters, G-SGTS, was about to enter at `Alpha One` for a Runway 23 departure when the controller directed the morning Philadelphia-bound American Airlines Boeing 757 to enter the runway at `Bravo Two` and backtrack to line-up and jump the queue. 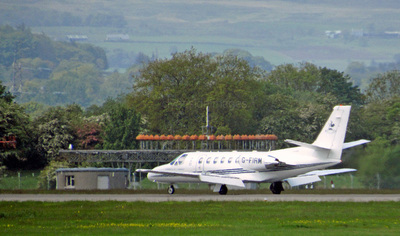 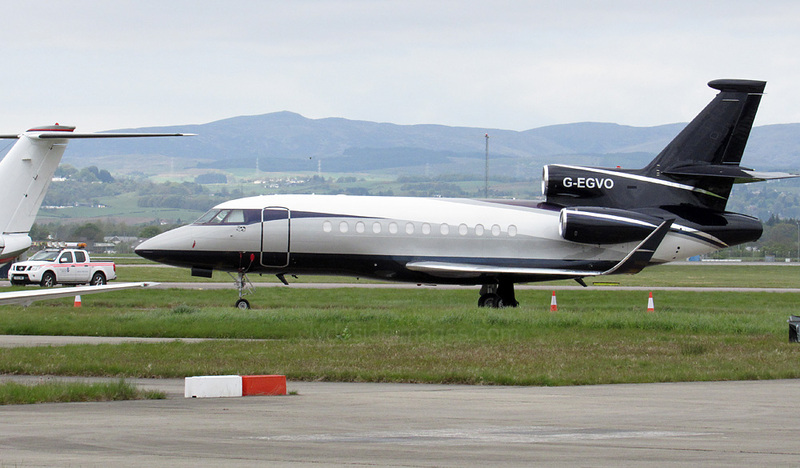 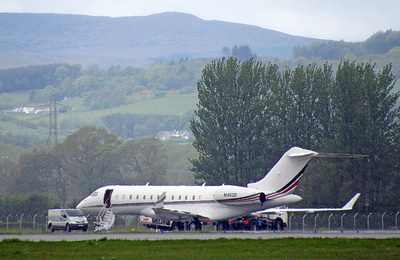 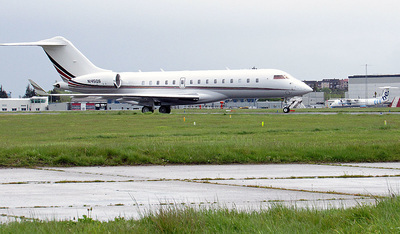 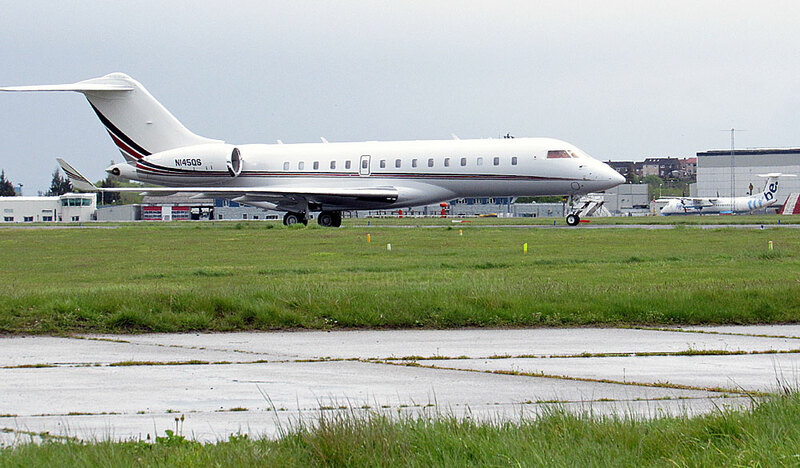 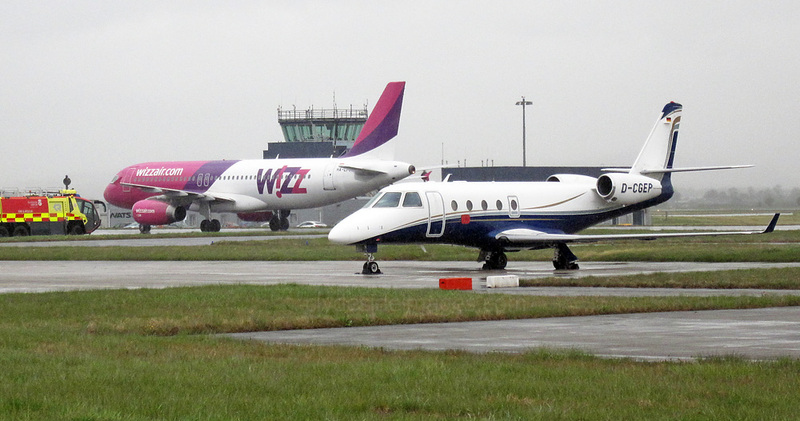 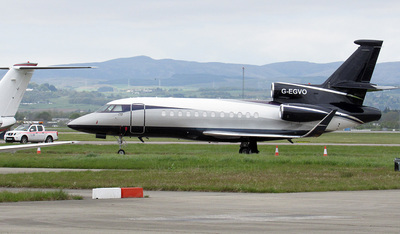 Dassault Falcon 900EX G-EGVO and Cessna CitationJet CJ3 G-YEDC were photographed together on Thursday 14 May. Cessna 560XL G-IPAX, King Air 200 G-CLOW and Serbian-registered Citation VII YU-BTM were parked on the Executive Ramp when I passed by on 1 May. 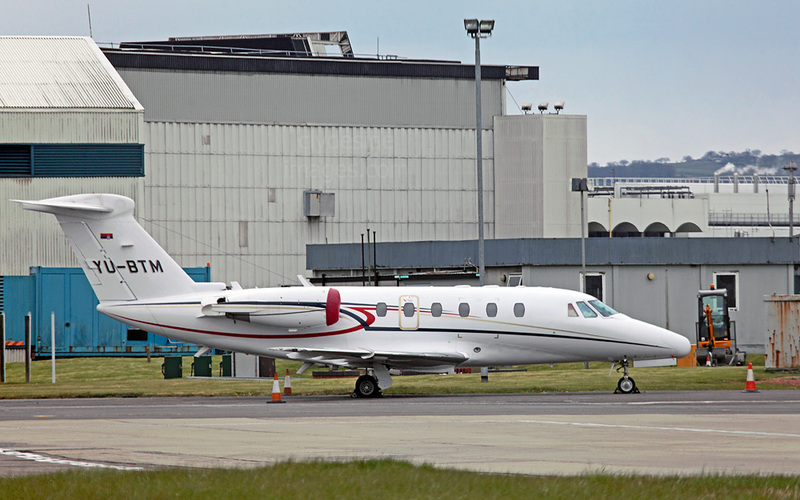 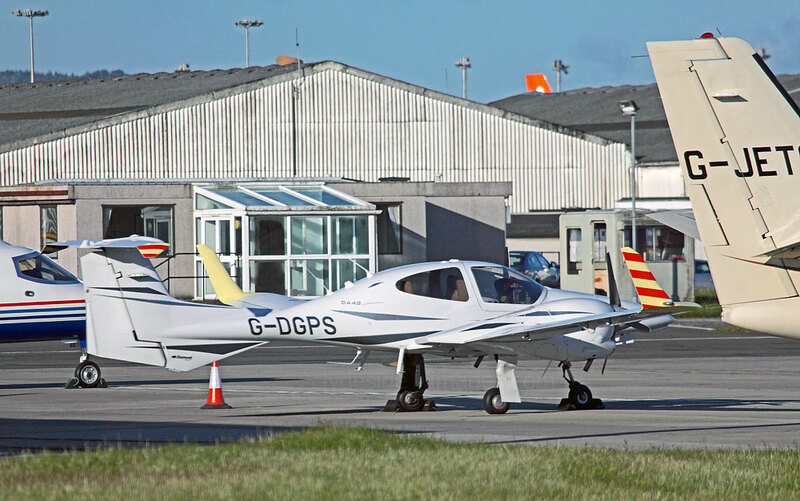 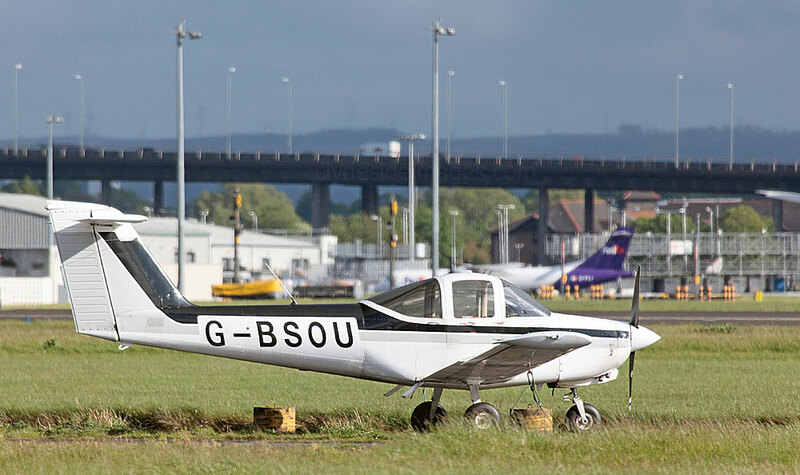 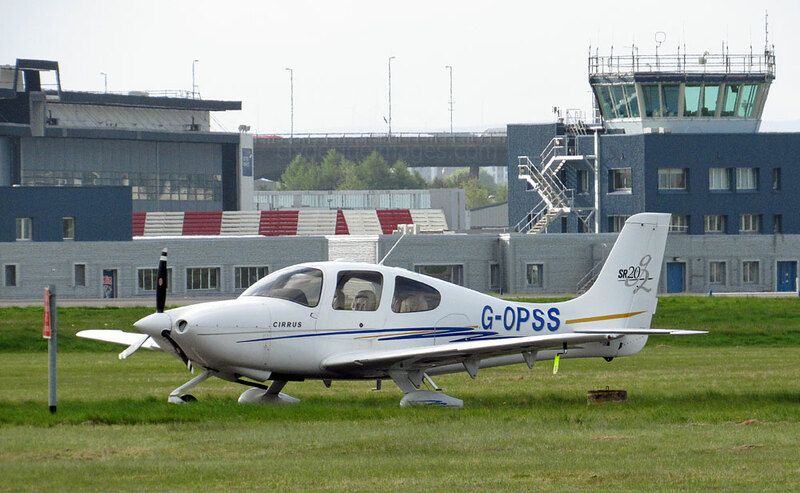 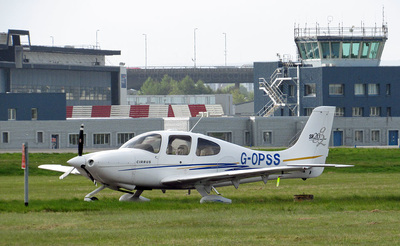 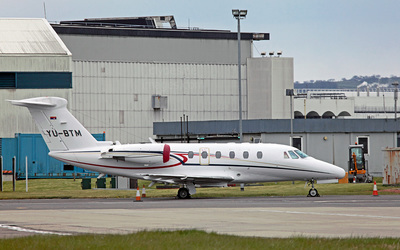 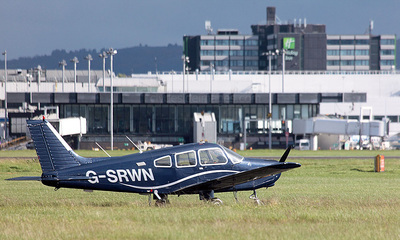 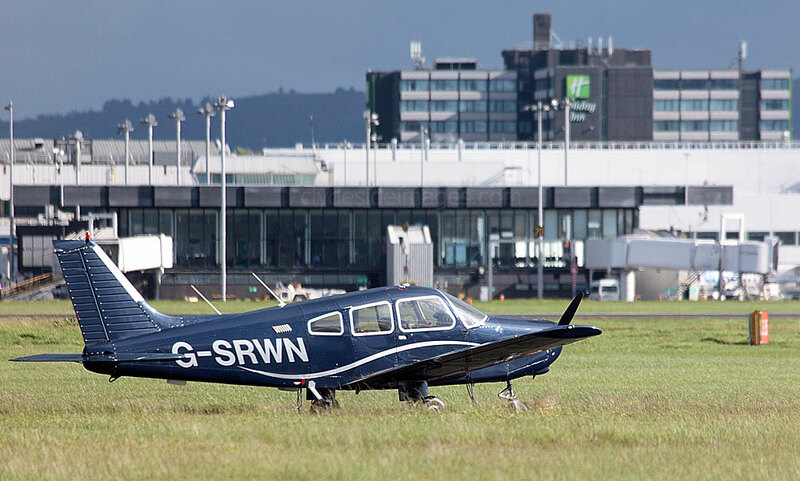 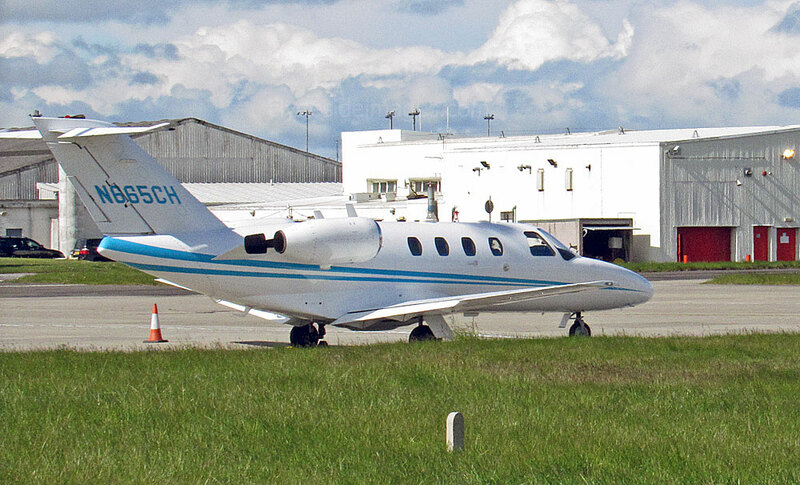 SOCATA TBM 700 N900BE arriving on 19 May. 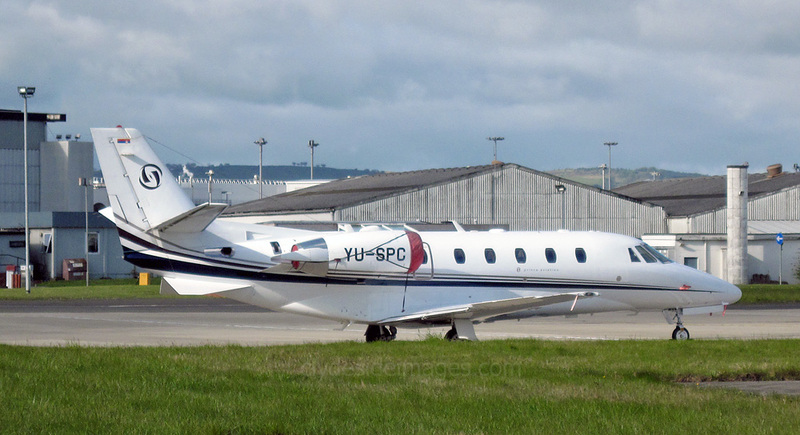 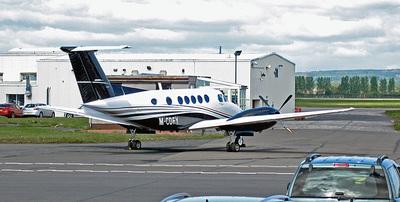 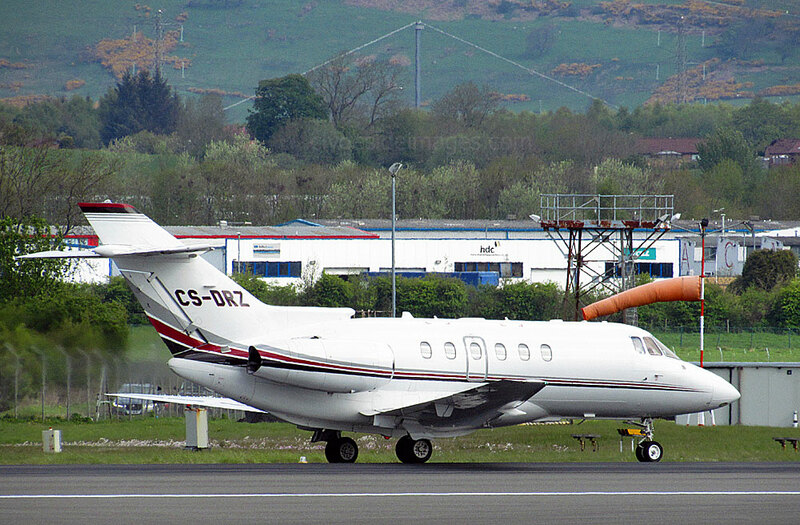 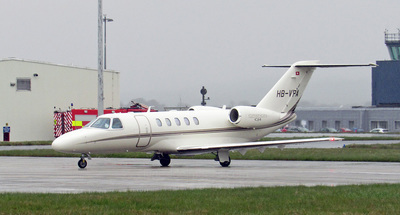 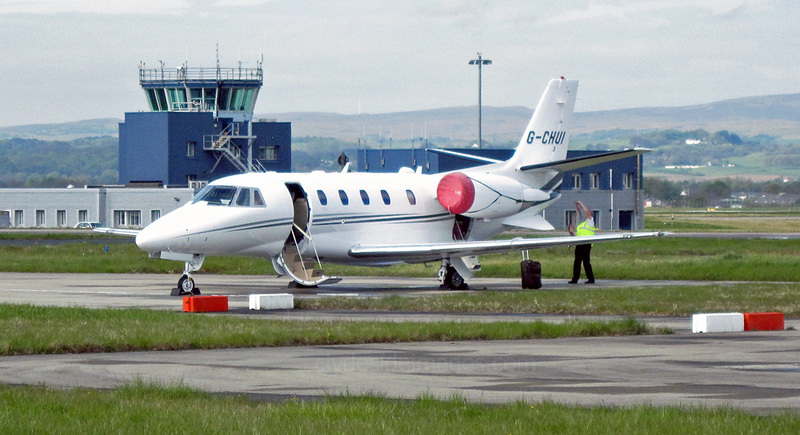 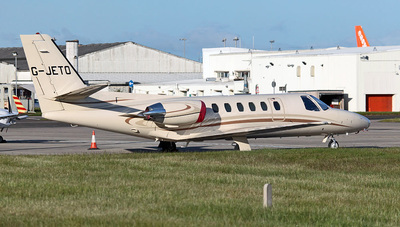 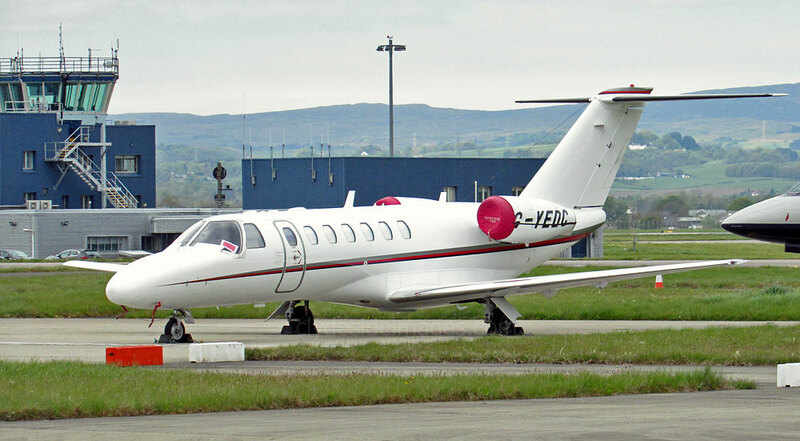 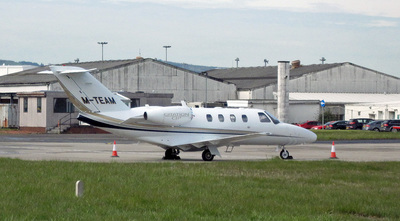 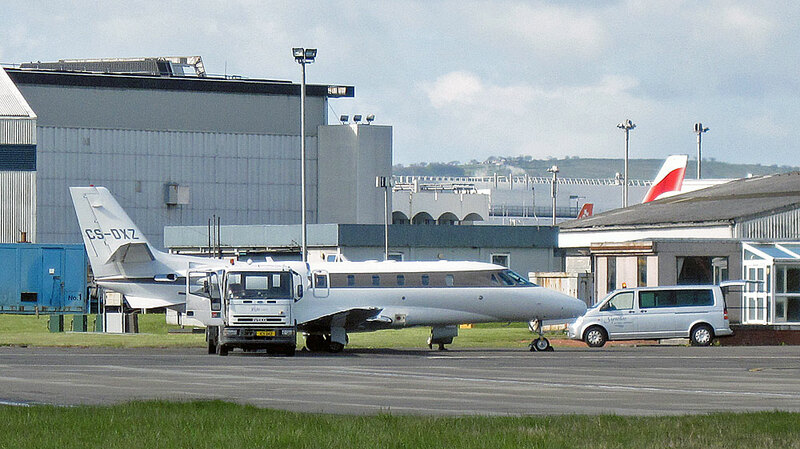 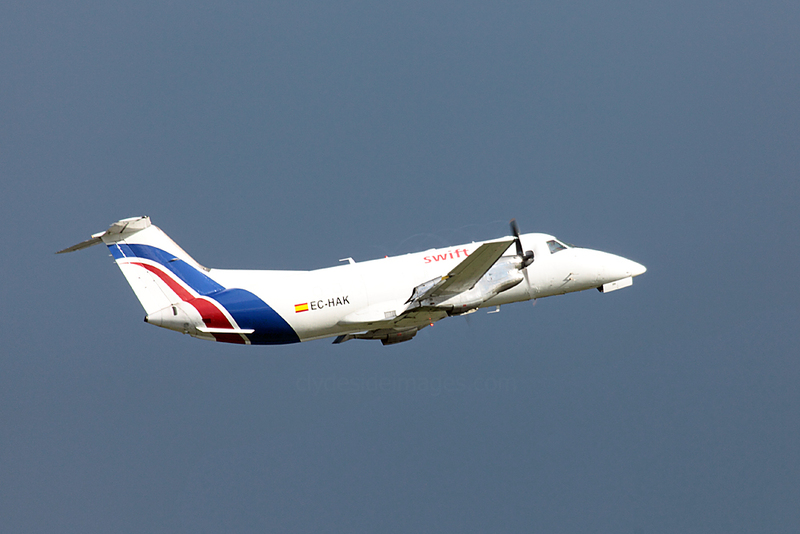 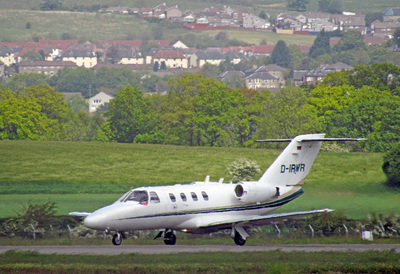 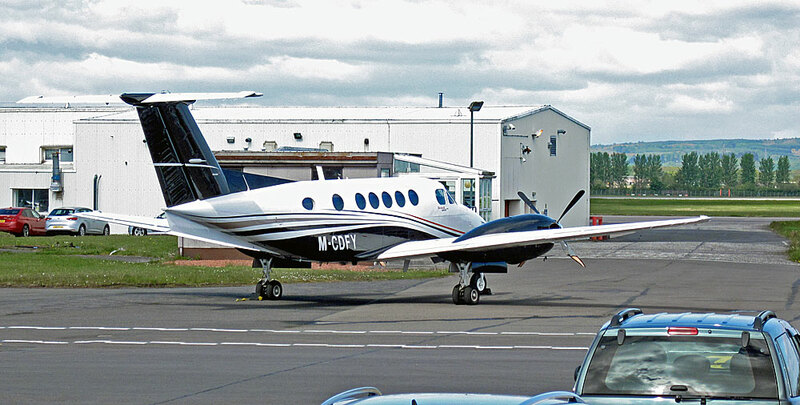 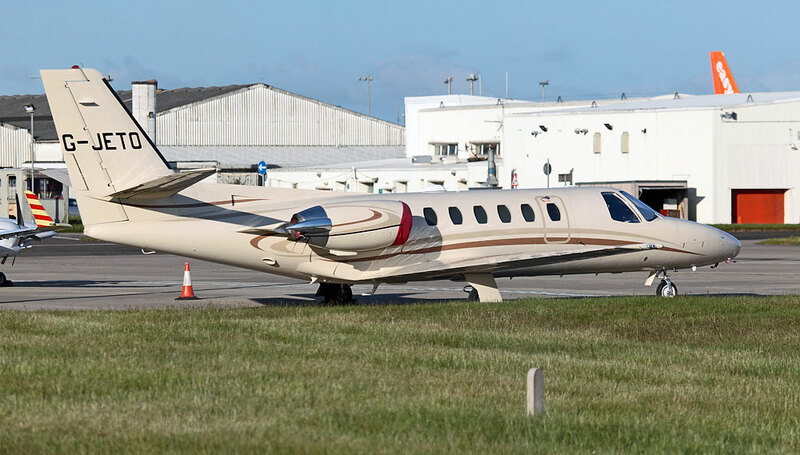 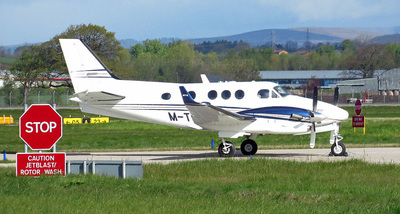 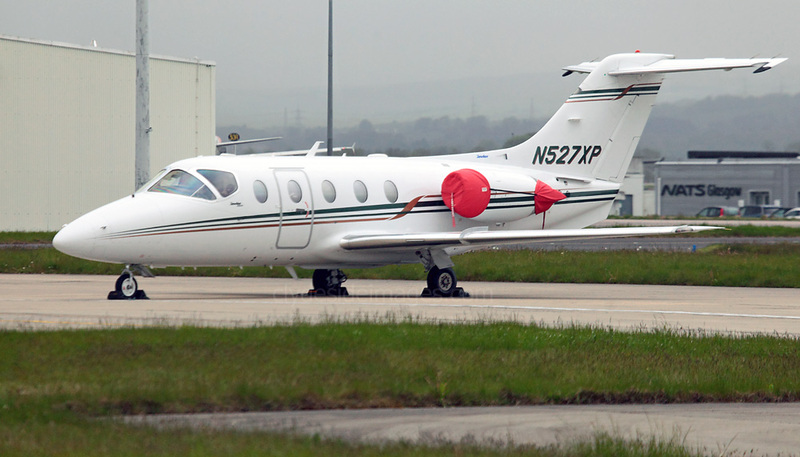 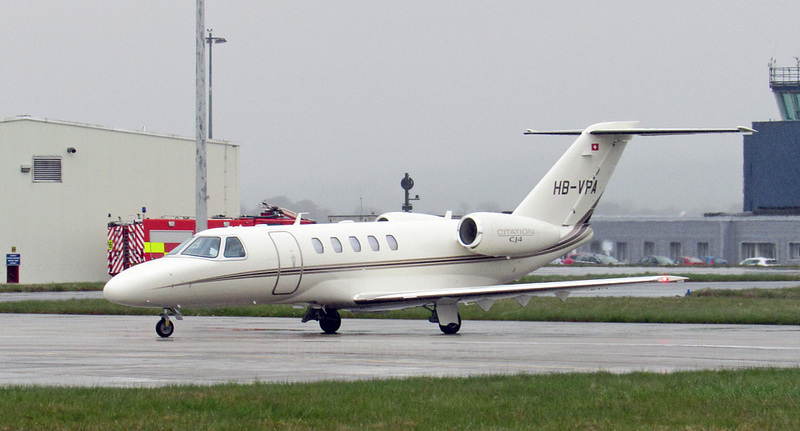 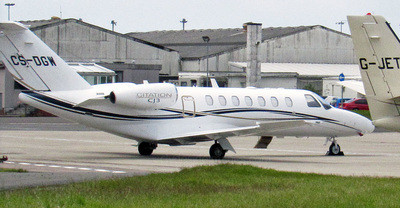 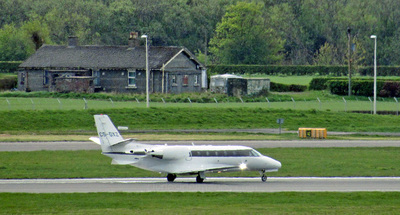 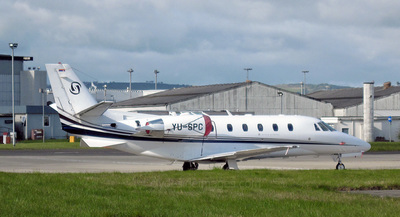 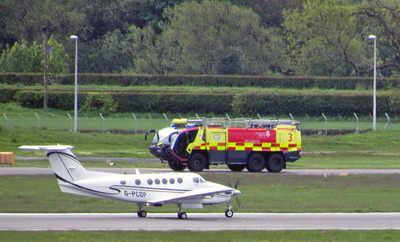 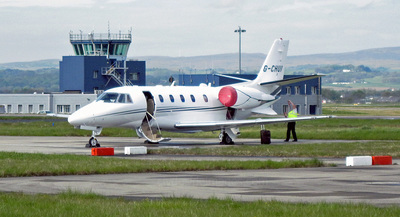 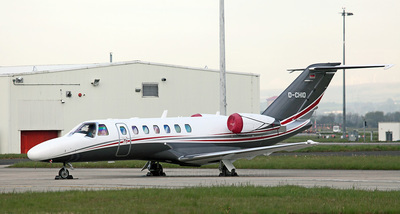 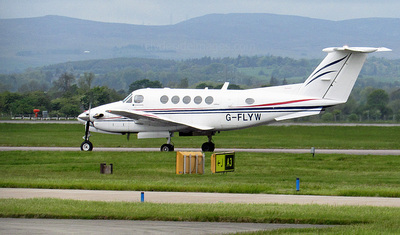 Pilatus PC-12/45 G-TRAT, seen here on 27 May, had arrived on the 23rd.